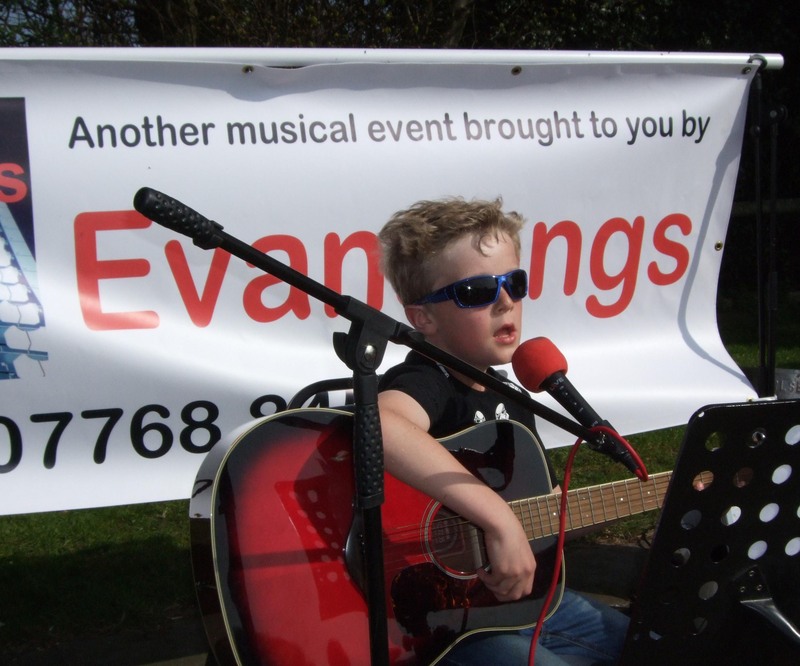 Evansongs run regular open mic nights for under 16s. It gives youngsters a platform to perform live what they have been learning and also gives parents a chance to see how they are developing. 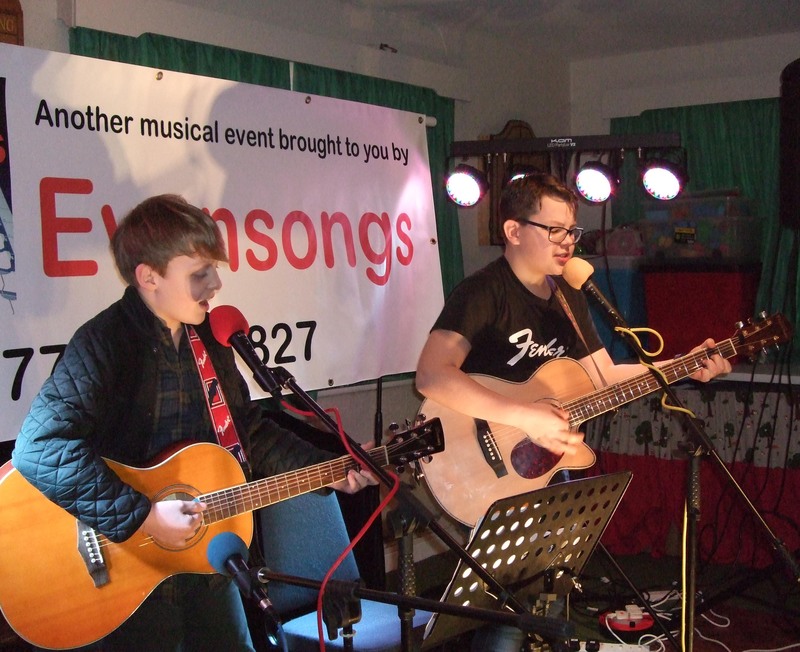 Kids open mic nights are free of charge to anyone who wants to perform or just watch and are open to anyone not just pupils of Evansongs. As the sun shone down on the beautiful backdrop of Lilleshall Hill an 'eggstra' special and 'eggciting' event was taking place at Lilleshall Cricket Club. 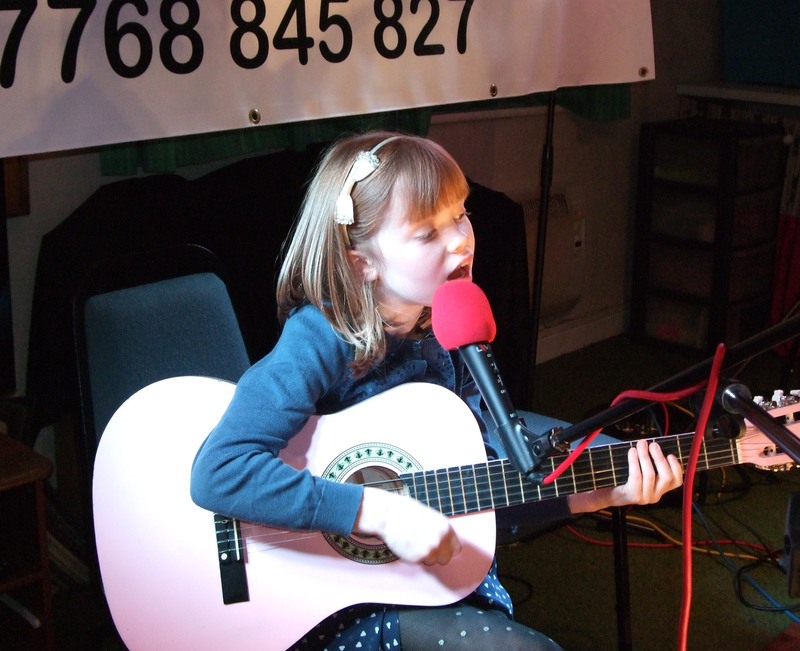 Yes, talented junior musicians had turned up to perform at the Kids Open Mic Easter Special! As it was such a lovely hot day it was decided to hold the event outside on the cricket field and what an atmosphere that created! Organiser Ken Evans opened the proceedings by announcing that everyone who performed today would get an Easter egg! First up on stage was Burton Borough Schools Macy Edward. He had prepared a special Easter set and it went down a treat, with the audience clapping along, especially to Simon and Garfunkel's Mrs Robinson a hit 37 years before he was born!! Nancy Kingsley was up next and what a performer she is becoming, getting more confident every time we see her. This time she played an exam piece which, if she plays it like that at the exam will ensure a pass!! Next up was Anika Srinivasan. Anika is a year 7 pupil at Newport Girls High School where she also studies music. This afternoon she played some two songs with some very intricate guitar accompanied by some note perfect vocals. Last Friday Anika went back to her old school Moorfield and performed some songs at their assembly. Alfie Hampton is now an open mic veteran and he showed today his skills by playing and singing a superb rendition of a Radiohead song. Oliver Edwards recently passed his grade 2 guitar exam and this showed in the note accurate performance of songs including an Oasis classic! The next act is becoming one of the area's top musicians. Jay Harris is currently appearing everywhere! Last week he was at the Shrewsbury 'Big Busk', then was interviewed on Radio Shropshire before doing a gig at The Pour House and next weekend his diary is full as well!!! Next up was a really special treat. Ruby and Maisie had been practicing very hard at a Little Mix song and it showed as they did an absolute fantastic performance which had the audience clapping along and it finished the afternoon off just right! Ken then thanked Shelly for the quizzes, Gerald for engineering the sound, Bev and Holly for handing out the prizes and the raffle, Diane Hampton for running the bar and providing the Cricket Club for us, and most of all, all the parents who's talented kids are what makes these events so popular. 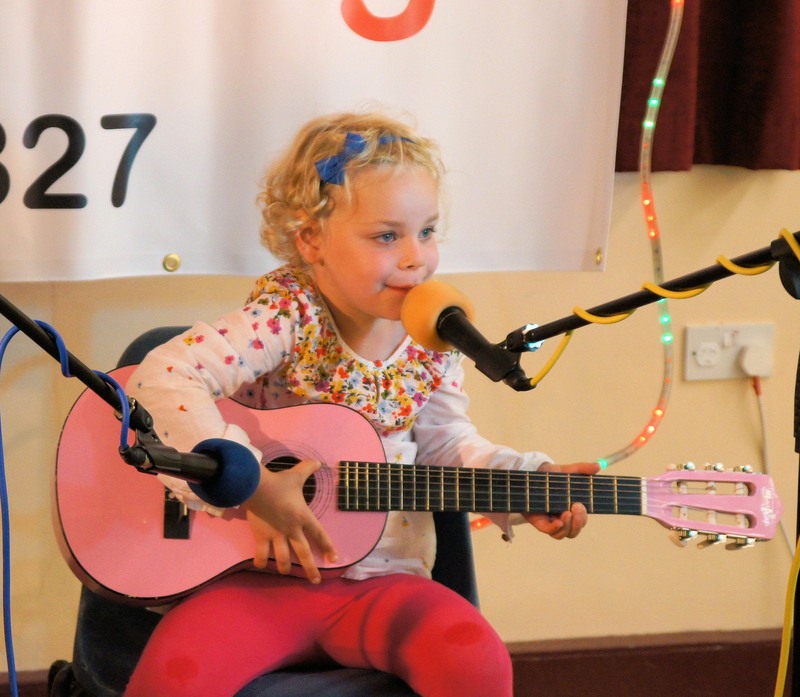 When Noddy Holder sang 'Merry Christmas Everybody' , it must have been after he had been to a kids Christmas open mic as last Sunday was an experience never to be forgotten!! 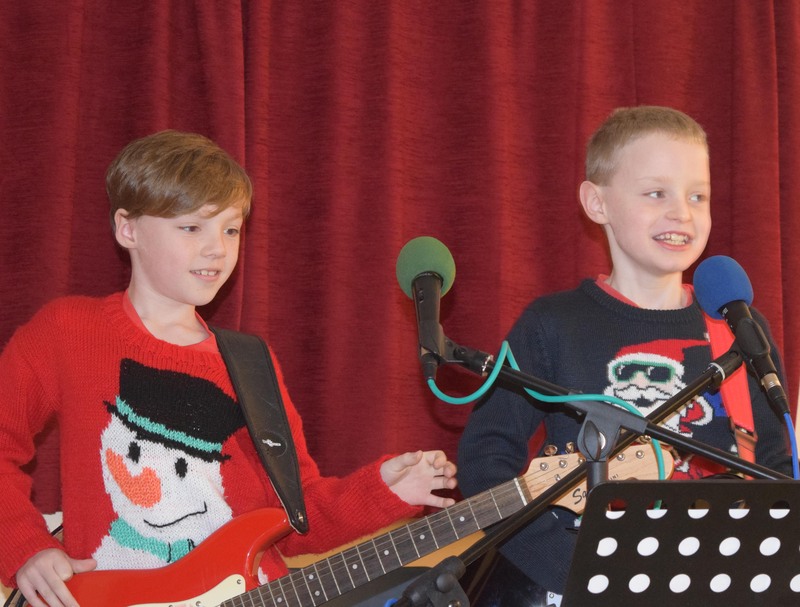 Yes, it doesn't seem like only 2 months since the kids were belting out Halloween songs but today they were again in fine form at the Kids Open Mic Christmas special at Lilleshall Cricket Club. For the first act over 15 junior guitarists were on stage singing and playing Slade's 'Merry Christmas Everybody' which got the packed room singing and clapping and well into the spirit of things. Staying on stage was girl band 'Triple Trouble'. Consisting of Ruby, Nancy and Maisie. With a combined age of only 18 they are certainly on the road to success!! They did their own version of 'Rudolf' which had the audience shouting for more!! Next up was Anika Srinivasan. Anika is a year 7 pupil at Newport Girls High School where she also studies music. This afternoon she played some very intricate guitar including an Ed Sheeran classic, accompanied by some note perfect vocals. Next it was time for the audience to take part and sing a carol and with a packed room singing you could have been forgiven for thinking that Gareth Malone was conducting!! Alfie Hampton next and he took us back to the 1970's, 30 years before he was born, with Wombling Merry Christmas and Merry Christmas Everybody!! Macy Edwards admitted he was exhausted after a busy musical week. Wednesday he had been playing his trumpet at a concert with The Burton Borough Junior Wind Band, and this afternoon it was time for his guitar to come out. 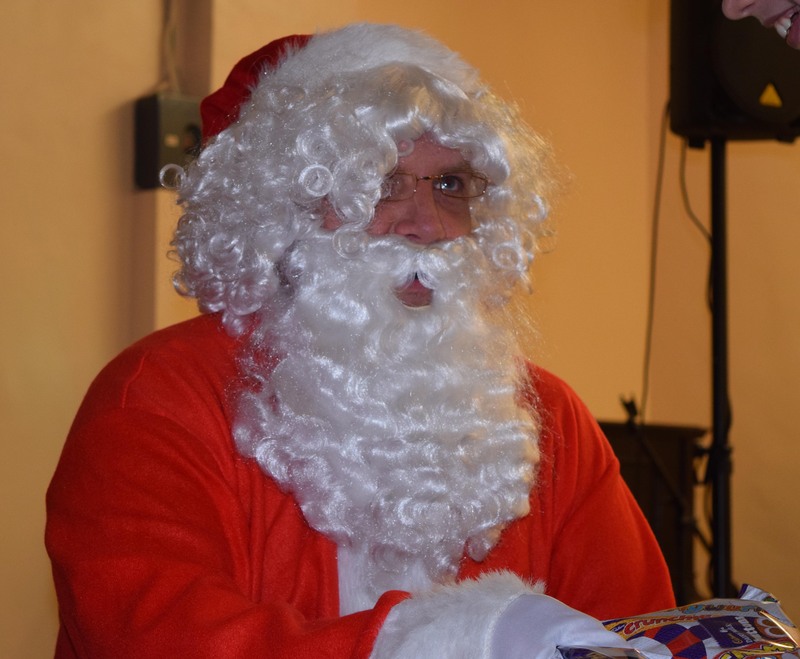 Then the sound of reindeer bells filled the room and guess who had turned up - yes it was Father Christmas. The kids helped him to his seat where he spoke to them all and handed out presents before he took to his sleigh and flew off into the sky, whoa - we never expected that!!! A very special performance next from two Burton borough pupils Michael and Liam. They kept their performance very tight and did a superb performance of 'Wish You Were Here' by Pink Floyd. Nancy KIngsley hasn't been playing guitar for very long but what a performance from her! Megan Gillespie had a special treat for the audience today. She had written a song containing maths questions which the audience had to solve - how clever is she!! 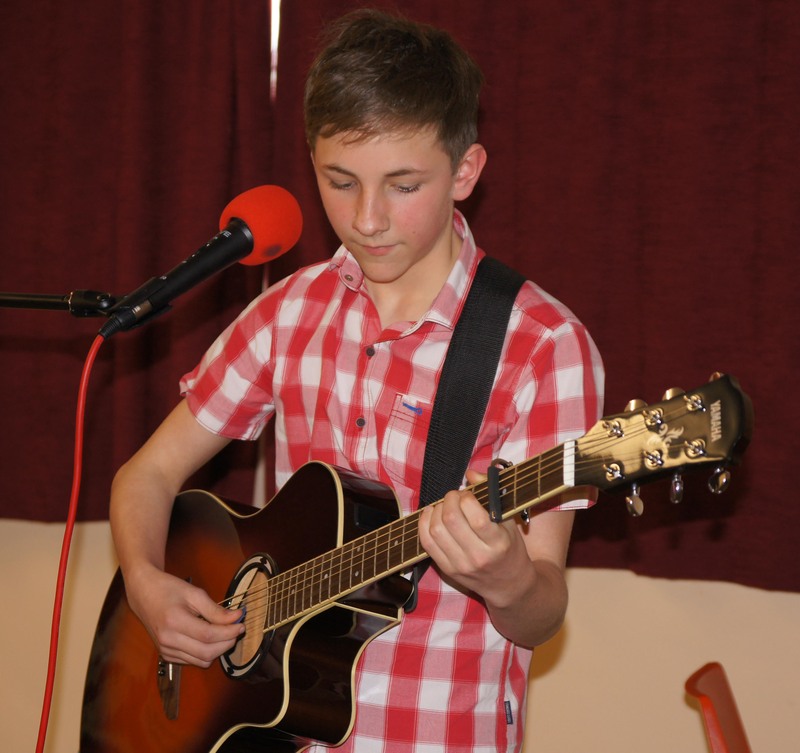 Liam Anslow then took to the stage and performed and amazing set with some superb and accurate guitar playing. Going solo now and rounding off the afternoon was 'Triple Troubles' Ruby Allen. She played and sang 'Away In A Manger' - not a dry eye in the room!! After the raffle and answers to the quiz it was time for Ken Evans, of sponsors Evansongs to say a big thank you to Gerald Maddox for engineering the sound, Shelly Maddox for preparing the quizzes, Diane Hampton for the use of the club house and running the bar, Santa for coming to see us, and to everyone else who helped out. And finally a massive thank you to all the parents for having such talented youngsters without which we couldn't put on such a show! The moon was big and bright over Lilleshall last Sunday. If you listened carefully you could hear some spooky sounds. 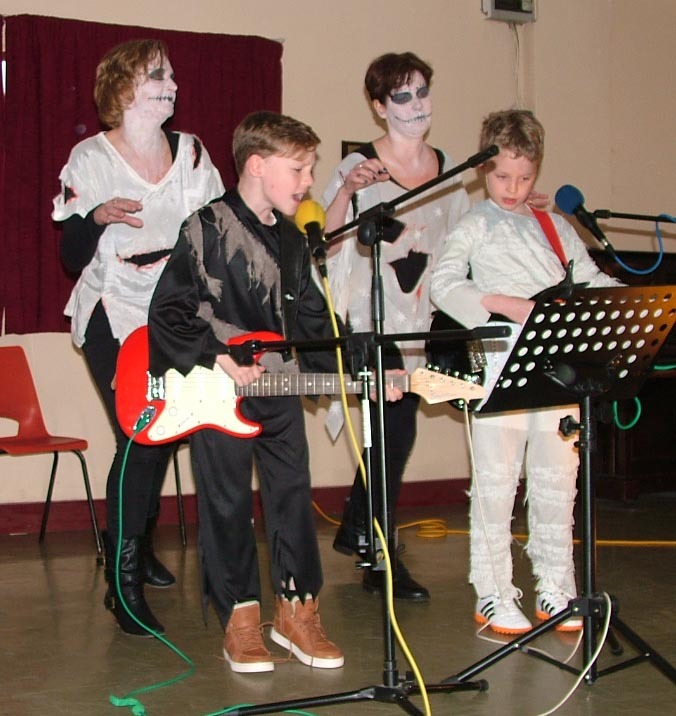 Was it ghosts and ghouls - NO - it was the kids open mic Halloween special at Lilleshall Cricket Club!!! Yes, at their new venue the kids were all well rehearsed and ready to go! First up on stage was Nancy Kingsley. It was Nancy's first open mic performance and although she has only been playing guitar for a few weeks she was playing and singing her way through her set like a seasoned performer. I'm sure we will see more of her at the next open mic! Next up was Kym Winnall. 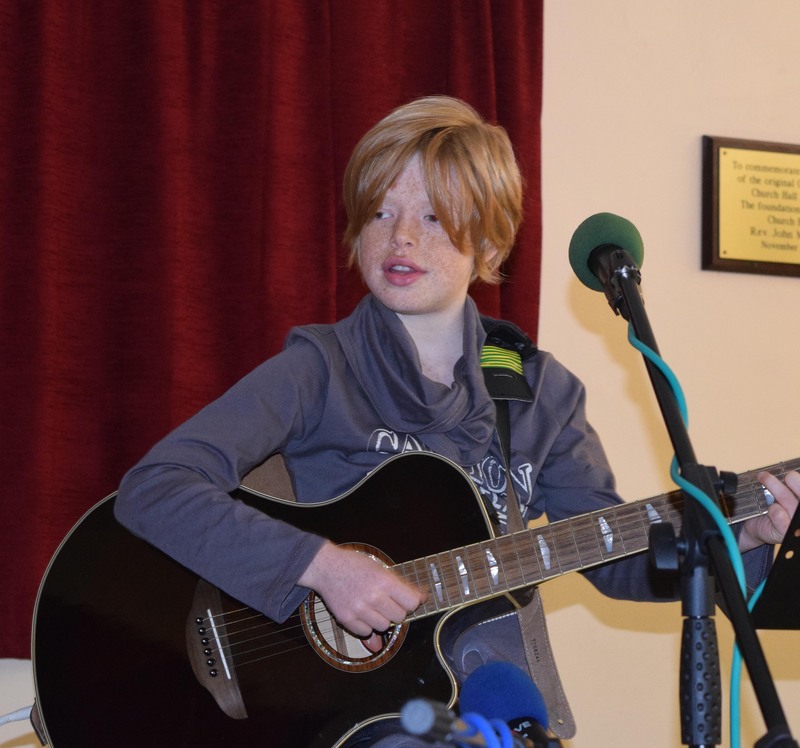 Kym, who is also in the Moorfield School Guitar Band, not only plays some fantastic guitar but also likes to tell a joke or two on stage - what an entertainer! 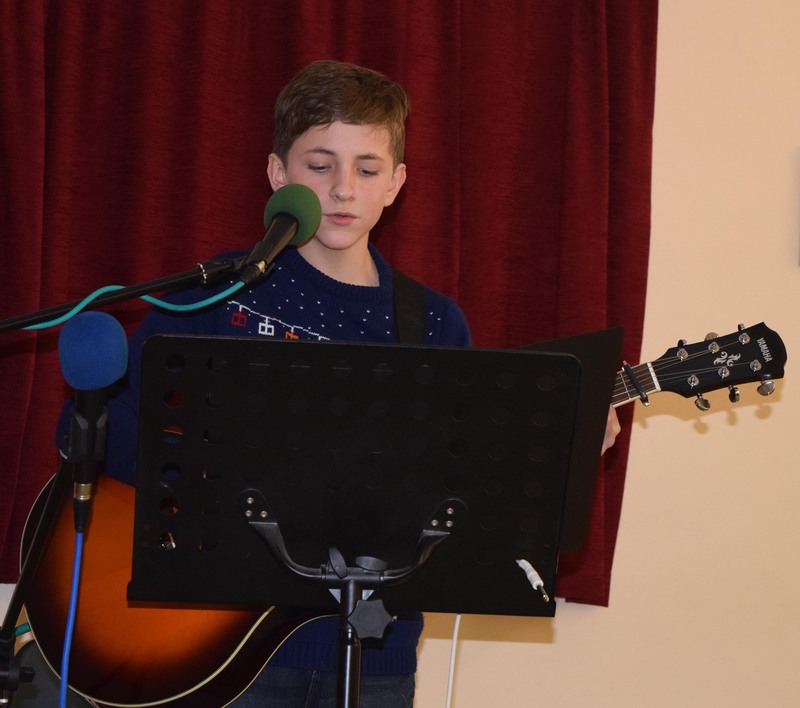 Adams Grammar school pupil Alfie Hampton is no stranger to the open mic nights and he entertained the audience with some of his forthcoming exam pieces. Ruby Allen then graced the stage. Ruby, who goes to St Peters and Pauls School in Newport had written two songs especially for Halloween and not only were they brilliant but they were also very scary! A real treat next. Brother and sister Finlay and Maisie had been practicing very hard to prepare a set of songs that demonstrated their delicate voices and intricate guitar work. They certainly didn't disappoint! Macy Edwards, who was looking very spooky then took to the stage. He played songs from the eighties right up to some modern stuff which included Ellie King's 'Ex's and Oh's' and Bon Jovi's 'Shot Through The Heart'. Then organiser Ken Evans had a big surprise for the next performer. 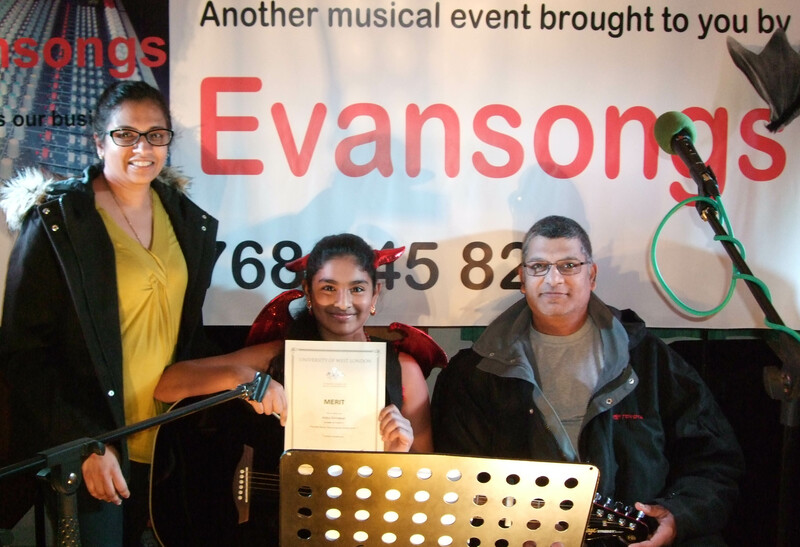 Anika Srinivasan, who attends Newport Girls High School, had recently taken her grade 3 guitar exam through The University Of West London. Ken was at the university last week and had brought her results back in a sealed envelope. He gave Anika the envelope who then opened it in front of the packed room to reveal she had passed with a merit - well done Anika!! Another experienced performer Liam Anslow, who also plays in The Burton Borough Junior Big Band admitted to being exhausted after a days busking the previous day in Shrewsbury's Pride Hill! But he certainly didn't let that affect his note perfect performance. Two previous performers, Nancy and Ruby, who had never met before had been having a chat. They both discovered they were big fans of girl band 'Little Mix'! So they decided to form a band and perform today!! They called themselves 'Double Trouble' and played and sang 'Black Magic' (well it was Halloween), how good was that on the spur of the moment!!! 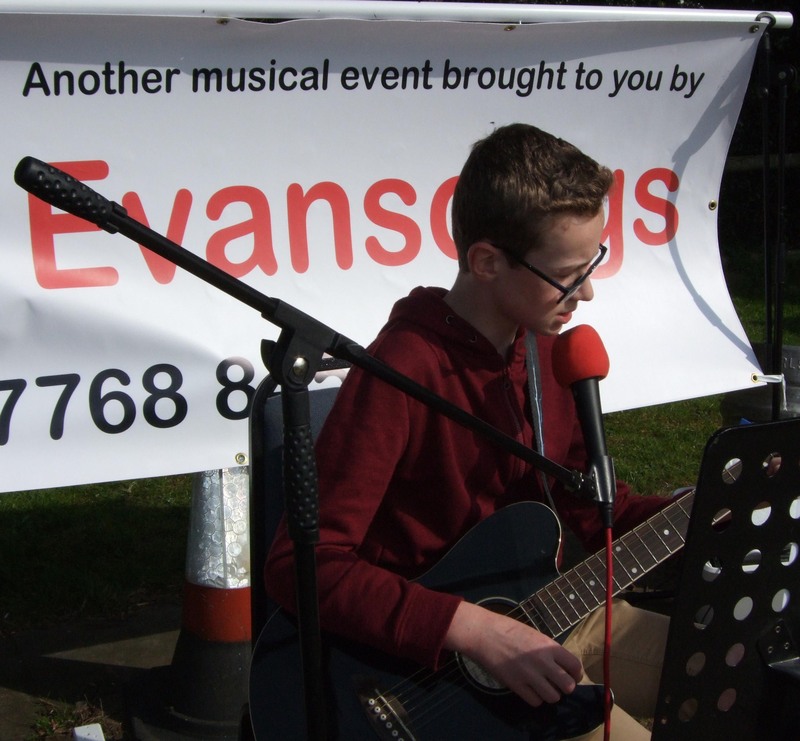 Charlie Edwards who had recently passed his guitar exam was all ready and prepared to entertain, and entertain he did , getting the audience singing along with songs such a s The Beatles 'Yellow Submarine'. Not the be outdone by his younger brother Oliver then followed with an amazing performance which included James's 'Sit Down'. To finish off the afternoon Finlay Rogerson did a solo performance and with note perfect vocals and finger picking guitar left the audience mesmerised. No need to travel all over the country this summer to festivals when we have young talent right here in Newport providing the perfect entertainment for you!! 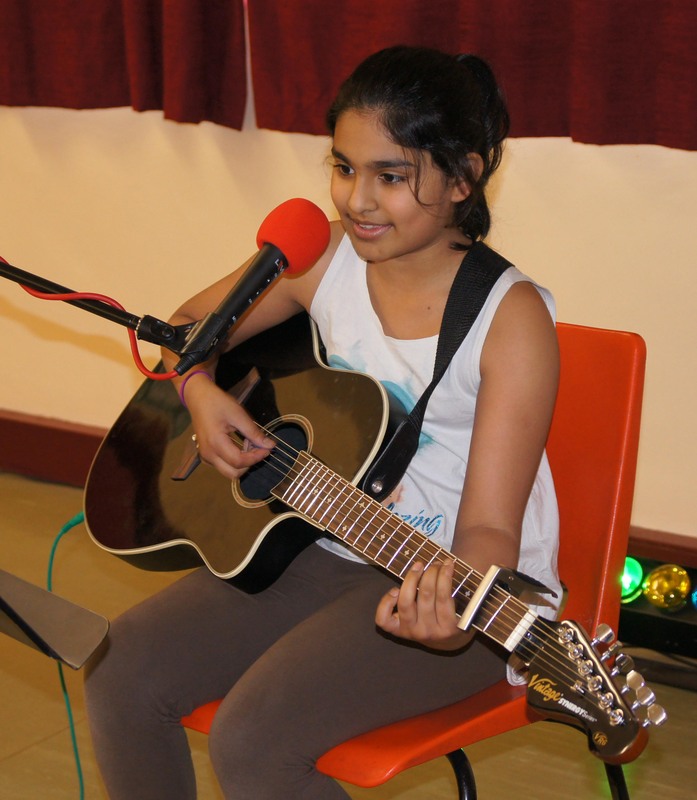 Yes, a packed room at St Andrews Church Hall, Church Aston saw plenty of young talent take to the stage to play and sing at the Kidz Open Mic Summer Special. Ken Evans, of sponsors and organisers Evansongs got things underway by introducing the first act, The 'Mine Crafters' (Macy Edwards and George Bate) with their backing band 'The Cheeky Girls', (their respective mums!!). They got the audience clapping and tapping their feet to 'Walking On Sunshine' and 'Happy', and got everyone into a summer mood. Next up is no stranger to open mic events. Jay Harris performs regularly at The Royal Navy Club on Tuesday nights and at weekends can be found busking in and around Shropshire. He demonstrated what a talented singer and guitarist he is. 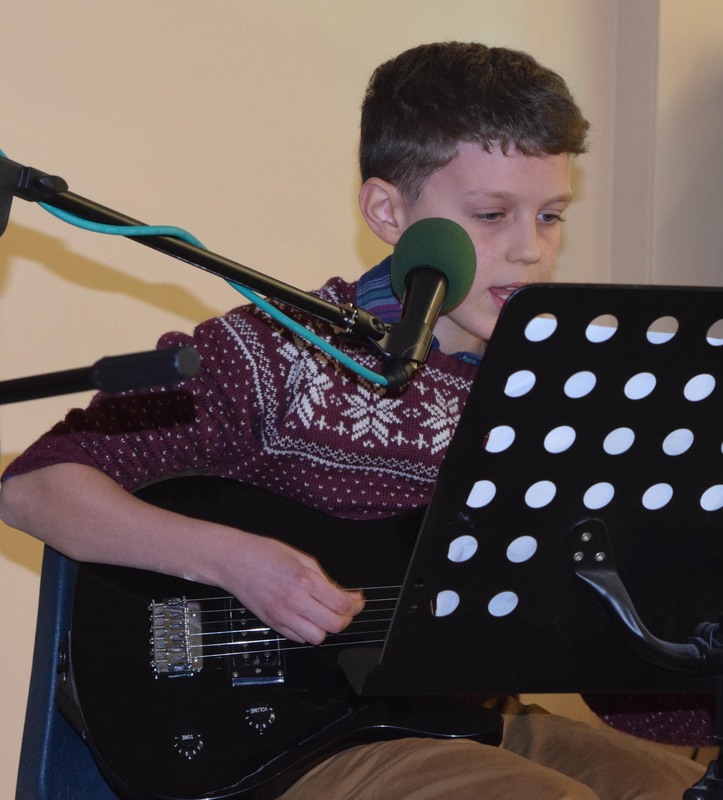 What a hard act that was to follow, but follow he did, yes Moorfields School pupil, Alfie Hampton took to the stage to demonstrate his guitar skills and finished off with a superb rendition of 'Nothing Else Matters' by Metallica! Another Moorfield pupil next. Anika Srinivasan then demonstrated her intricate guitar work. She also played a note perfect 'Mama Mia' by Abba. It was then time for Emily Banks to have a break from handing out prizes and cups of tea to entertaining the audience. She demonstrated what a keen guitarist she is and how well her voice compliments her playing. Six year old Freddie Dickson then announced that he would be playing a classical piece of music, not only that but it was the song that his mum walked down the aisle to when she married his dad! Yes, Freddie did a note perfect rendition of Pachelbels's 'Canon In D''. However, he then topped that by playing an Irish folk song - on the spoons! He thanked his uncle George back in Ireland for teaching him the song and how to play the spoons. Always a treat to listen to is Finlay Rogerson. His intricate guitar work together with his note perfect vocals make him one of the top acts at the open mic. But not only did he perform some classic songs he played 10 famous guitar riffs which became part of this afternoons quiz - what a talented musician. Jasper Wright looked worn out, and so he should be this was his 7th performance of the summer so far! Two solo performances and five performances with The Moorfield Guitar Band. He kept up the summer theme by playing 'Here Comes The Sun' by The Beatles. Not to be outdone by her brother Bronte Wright then graced the stage. 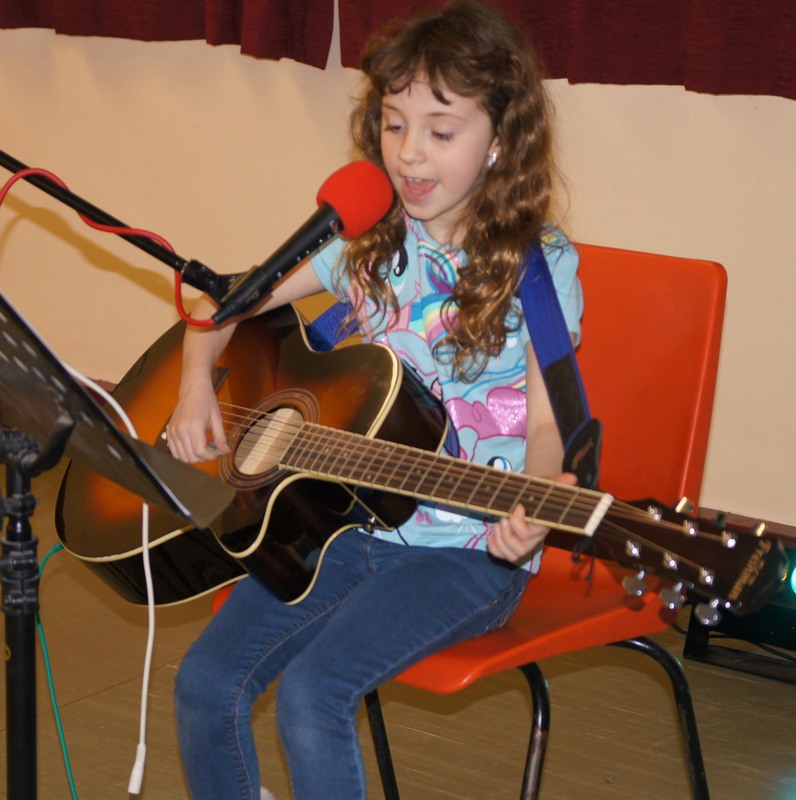 She has also been performing during the summer with The Moorfield Guitar Band. This afternoon she played and sang the song 'Tomorrow' from the musical 'Annie'. 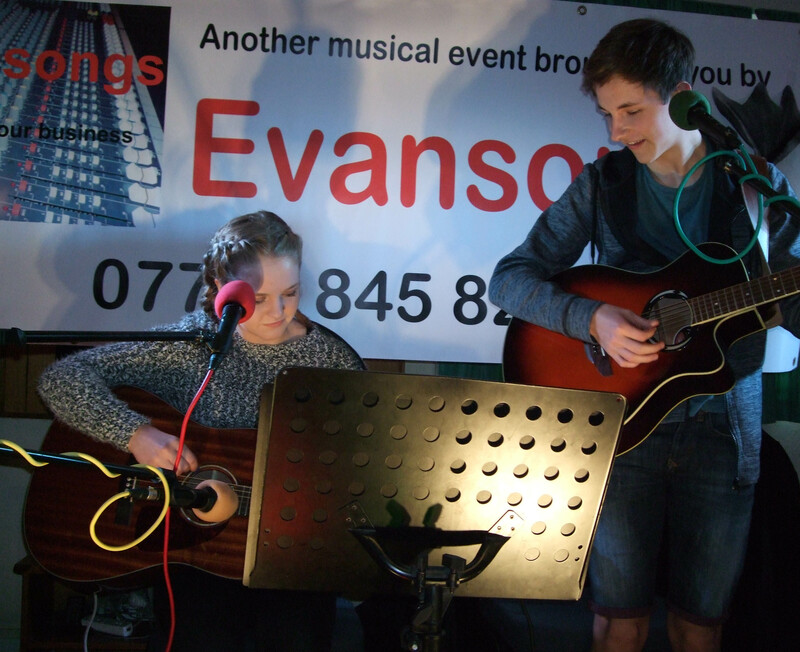 Next up were two brothers, Oliver and Charlie Edwards. They both played exam pieces and demonstrated how talented they are at their instrument by not making any mistakes at all! The final act was lead by Kym Winnall and was a performance by the Moorfield Guitar Band and 'guests'. They sang 'He's Got The Whole World In His Hands' which had all the audience singing along. The Moorfield Guitar Band are going to the recording studio over the summer holiday to record a CD in time for Christmas. More details on that will be published in the Newport Advertiser in the coming weeks. Ken then thanked Shelly Maddox, and Finlay Rogerson for the quizzes, Emily Banks and her Mum Sheron for sorting out the prizes and refreshments etc. Jay Harris for stage management, Bobby B for the photos, Gerald Maddox for the sound engineering, St Andrews Church for the hall and most of all, all the parents who's talented kids are what makes these events so popular. 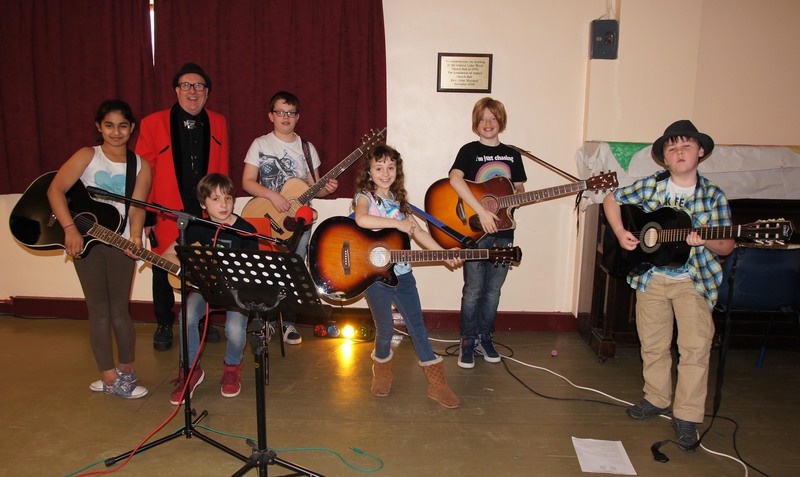 An 'eggstra' special and 'eggciting' event took place last week at St Andrews Church Hall in Church Aston as talented junior musicians turned up to perform at the Kids Open Mic Easter Special! With standing room only, organiser and compare Ken Evans addressed the audience and said that everyone who performed today would get an Easter egg! First up on stage was Jay Harris. Jay is a year 7 pupil at Burton Borough School and is no stranger to open mic events and performs most weeks at The Navy Club in Newport. Jay set the pace with songs by Green Day and Bryan Adams. From an experienced open mic performer to a debut performance. 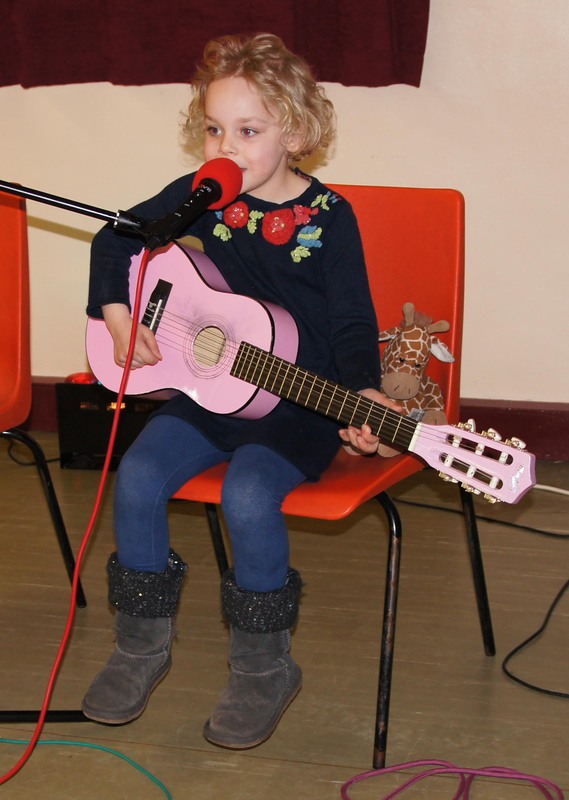 Emily Banks, a year 4 pupil at Moorfield Primary School, showed what a talented guitarist she is and played and sang 'Blank Space'. Back to another regular open mic performer. Always a pleasure to listen to is the delicate voice and gentle guitar work of Anika Srinivasan. By the time she had finished her set the whole room was in a chilled out mood! The next act was a real treat. The Moorfield Guitar Band had turned up! They got the whole room singing and clapping along to 'He's Got The Whole World In His Hands'. Band member Kym Winnall said afterwards ' we have done about 12 gigs so far as a band, but this for me was the best one yet!'. The band have two more gigs planned before they perform live at 'The Party In The Park' at Moorfield school on July 4th. Currently studying grade 4 guitar, Quinn Cummings was next and he performed 'That's Entertainment' by The Jam, and it certainly was entertainment! Another Burton Borough School pupil next. Liam Anslow played a superb acoustic set which included a self penned song. His stage presence and guitar work just ooze with confidence. A Lilleshall Primary School pupil next. Thomas Wright got to the stage but before he started his guitar tutor Ken Evans made an announcement. Three weeks ago Thomas had taken his electric guitar exams with The University Of West London and he had been eagerly awaiting his results. By coincidence his results had been received by Ken the previous day. So, Ken gave Thomas, live on stage, an unopened envelope from the university. The whole audience had their fingers crossed, and it worked, as he opened the envelope to reveal he has passed with an overall mark of 95% and a distinction!! Thomas went on to play songs by Guns 'n' Roses and Status Quo and you could see why he got such high marks! Always a treat to listen to is Finlay Rogerson. His intricate guitar work together with his note perfect vocals make him one of the top acts at the open mic. 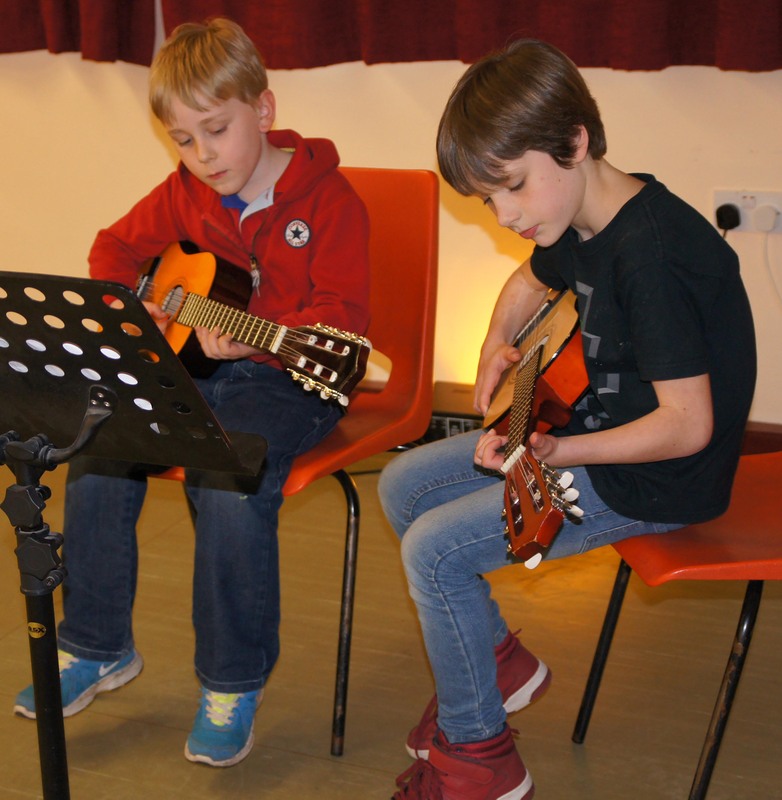 Two of the Moorfield Guitar Band then treated the audience to a song. Jasper Wright and Ben Marshall played note perfect and proved their worth as musicians. Not to be outdone by her older brother, Bronte Wright then graced the stage. Five year old Bronte who is in reception at Moorfield School played and sang 'Let It Go' from the blockbuster 'Frozen'. She goes to prove you are never too young to start playing an instrument, and it was a lovely act to send the audience away knowing that today's entertainment had been second to none. Ken then thanked Shelly Maddox, and Quinn Cummings for the quizzes, Emily Banks and her Mum for sorting out the prizes etc. Bobby B for the photos, Gerald Maddox for the sound engineering and most of all, all the parents who's talented kids are what makes these events so popular. 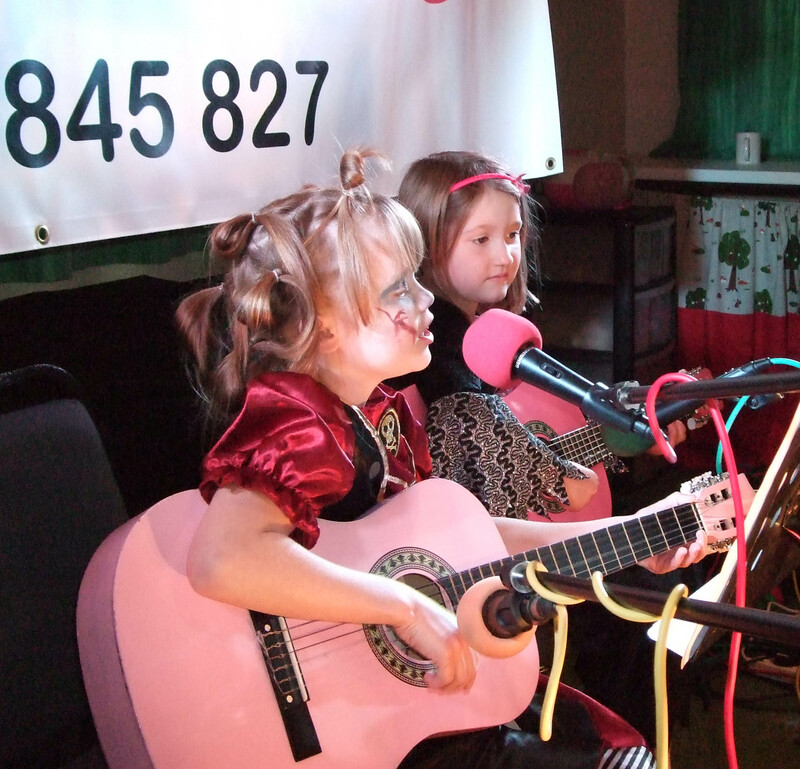 When Roy Wood and Wizard sang 'I Wish It Could Be Christmas Every Day', it must have been after they had been to a kids Christmas open mic as Sunday afternoon was an experience never to be forgotten!! Yes, it doesn't seem like only 2 months since the kids were belting out Halloween songs but today they were again in fine form at the Kids Open Mic Christmas special at St Andrews Church Hall, Church Aston. For the first act over 15 junior musicians were on stage singing and playing Slade's 'Merry Christmas Everyone' which got the packed room singing and clapping and well into the spirit of things. Steve 'Teddy Boy' Zodiac then said a few words and introduced the audience on the mayhem which was to follow. First to grace the stage was Jay Harris. Jay is becoming quite a famous face on the Newport music scene with regular appearances at The Navy Club open mic, but tonight he showed his peers what can be done by plenty of hard work and practice. 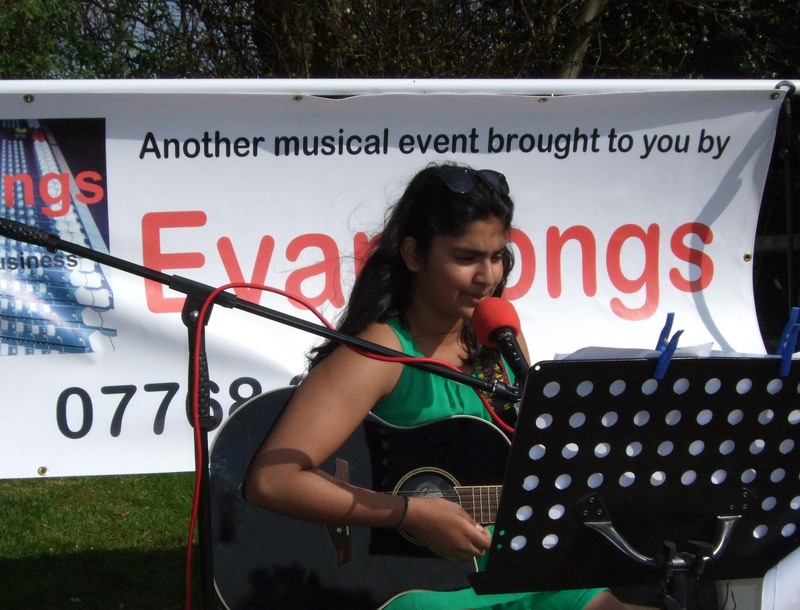 Another up and coming talented musician Anika Srinivasan kept up the high standard of music and with her new guitar had the audience mesmerised. A keen supporter of the open mic Quinn Cummings was next. He is currently studying his grade 3 guitar exams and demonstrated his talent by playing an exam piece. Next it was time to rock! Thomas Wright from Lilleshall School has the audience clapping and singing along with the Guns n Roses classic 'Sweet Child O' Mine, and he played and sang it note perfect. Another regular at the open mic, Liam Anslow then graced the stage and kept up the festive spirit with some classic songs. Then the sound of reindeer bells filled the room and guess who had turned up - yes it was Father Christmas. The kids helped him to his seat where he spoke to them all and handed out presents before he took to his sleigh and flew off into the sky, whoa - we never expected that!!! The youngest act of the afternoon followed Father Christmas. Six year old Freddie Dickson played and sang songs by Take That and Mark owen, I think he may have been having a look at his mums CD collection! Then Newport Junior Schools Macy Edwards and George Bate graced the stage. They had brought their backing band with them 'The Cheeky Girls' (aka Jacqui Edwards and Mandy Bate - their respective mums!!). They played festive songs including Fairytale Of New York. It was then time for the final performance of the afternoon and the slot was filled by Finlay Rogerson. Finlay, who is a graded guitarist played some very lovely guitar as well as singing and playing a note perfect 'Merry Xmas Everybody' by Slade. Finlay also plays guitar at his school, The Charlton in Wellington and I'm sure it won't be long before he is also giving guitar lessons there! After the raffle and answers to the quiz it was time for Ken Evans from organisers Evansongs to say a big thank you to Quinn Cummings and Shelly Maddox for the quizzes, Gerald Maddox for engineering the sound, Sue Jenkins for the admin, St Andrews Church for the use of the hall, and to everyone else who helped out - you know who you are - we do!!! And finally a massive thank you to all the parents for having such talented youngsters without which we couldn't put on such a show! The moon was big and bright as you approached Church Aston last Sunday and if you listened carefully you could hear some very spooky music - yes it was the long awaited Kids Open Mic Halloween special!! With the youngsters in fancy dress and the room full to bursting there was no time to lose in getting the budding rock stars on stage to play. To open the show we had our resident band 'The Minecrafters' (Macy Edwards and George Bate) with their backing band 'The Cheeky Girls' (aka Jacqui Edwards and Mandy Bate the respective mums!!). They sang and played a fantastic version of Thriller by Michael Jackson and certainly set the standard for tonight's entertainment. Alfie Hampton was up next and he sang and played 'Zombie' by The Cranberries and what a performance it was by this very talented vocalist/guitarist . Next up was Megan Gillespie. 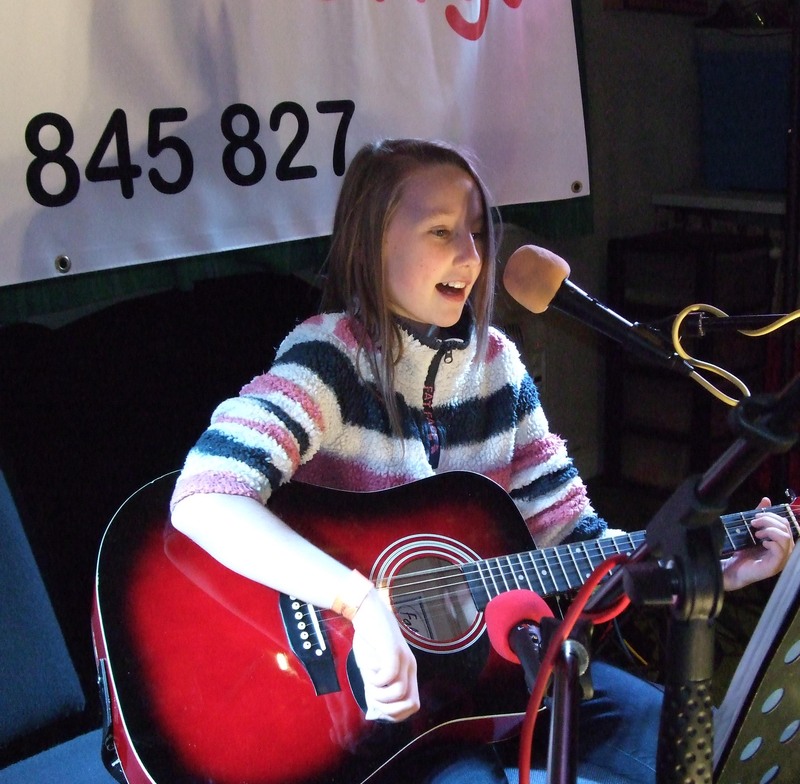 Megan showed her skills as a 'Rock Chick' by playing Living On A Prayer by Bon Jovi. Another Moorfield School pupil up next. Anika Srinivasan. Anika is now a well and truly experienced live performer and this was her 2nd live performance over the last two weeks having done a solo spot at her school assembly. Always a pleasure to listen to is Newport Junior Schools Jess Clegg. She played 'Rawhide' from The Blues Brothers film and then did a fantastic finger picking version of 'Hey There Delilah' by The Plain White T's. The next performer is becoming an open mike veteran. 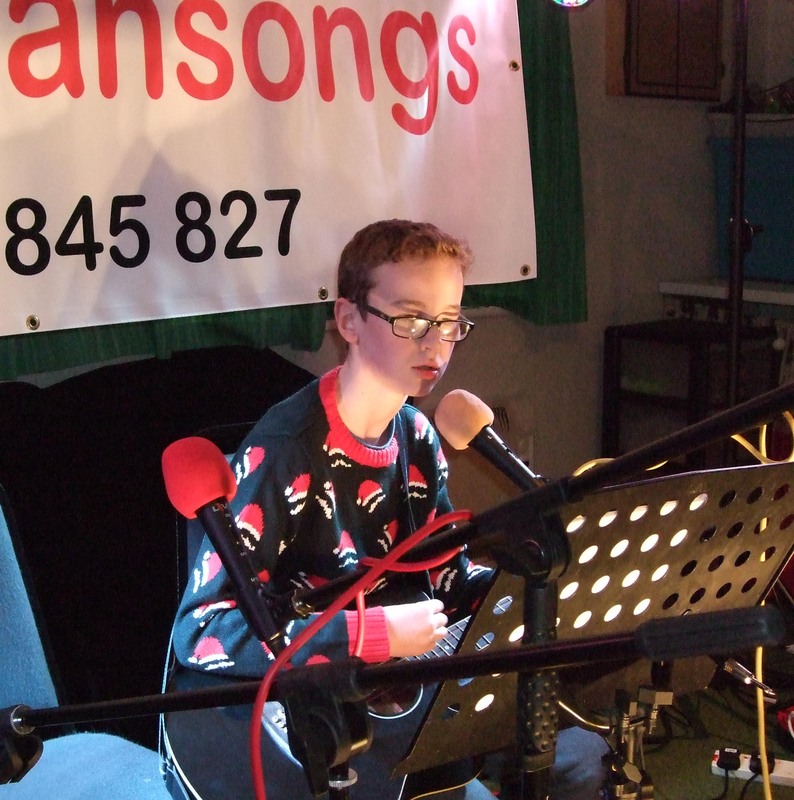 Year 7 Burton Borough School pupil Liam Anslow has supported the kids open mic over the last 3 years and he just goes from strength to strength. Liam also performs at the Royal Navy Club open mic nights with his friend Jay Harris. Another open mic veteran next in the shape of Quinn Cummings. 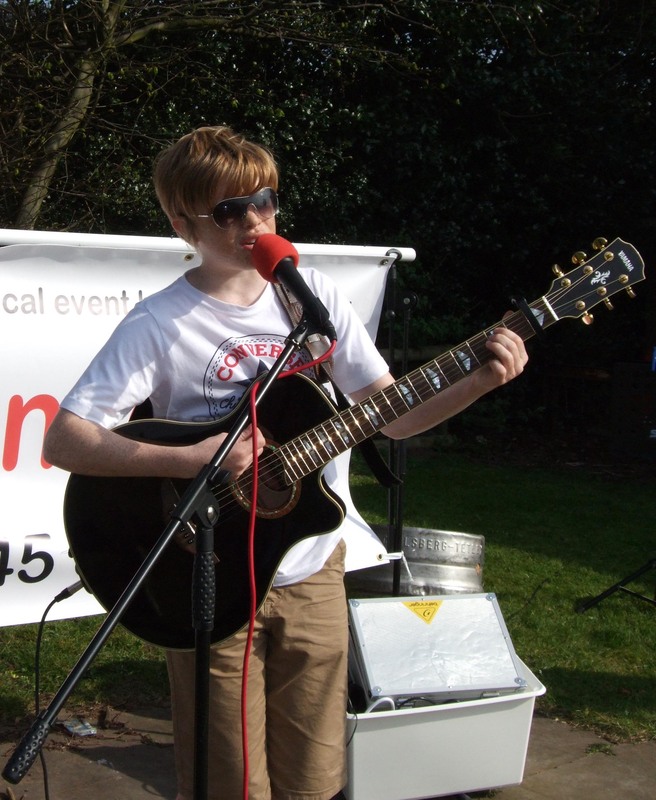 Quinn, a year 11 pupil at Burton Borough School, has been appearing at open mic for 5 years. He currently took his grade 2 guitar exam through The University Of West London which he played a piece from tonight. He received his results last week - a pass with a merit - well done Quinn!! He also kept up the Halloween theme tonight by playing and singing 'Werewolves Of London'! Not to be outdone by her younger sister Leah Gillespie was next to entertain. 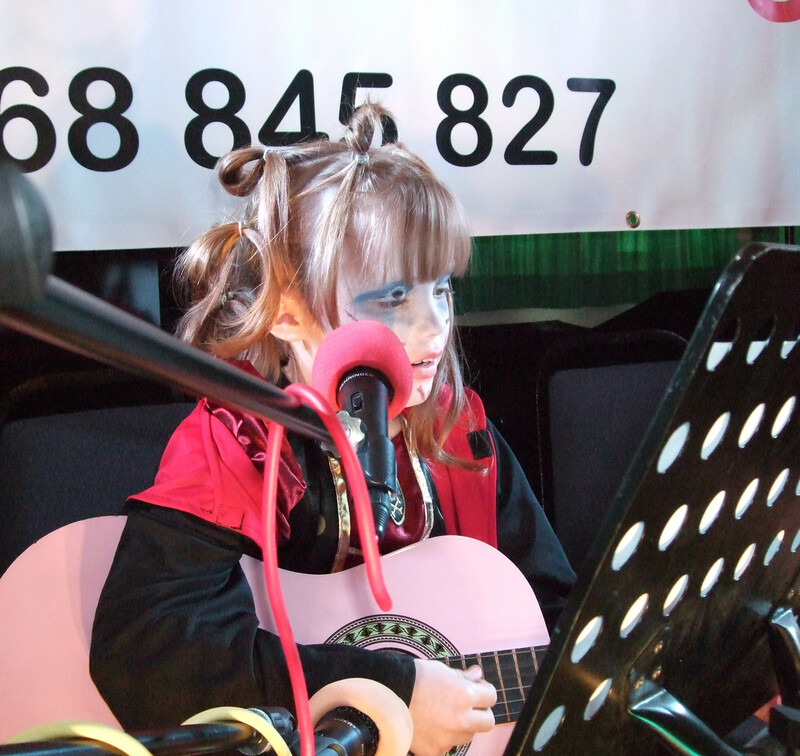 She is a big fan of Miley Cyrus and sang 'The Climb' which was note perfect in vocals and guitar. Leah is currently writing and recording her own songs and has promised to play a couple at the next open mic, we can't wait Leah! Yet another Moorfield pupil! This time it was Harry Roberts. Harry sang and played 'Bonfire Heart' by James Blunt and had the audience singing along with his perfect rendition of this classic song. Another open mic debut next for Oliver Edwards. Oliver recently took his guitar exams through The University Of West London. He passed with 95% and a distinction! You could see why when he played 'I'd Do Anything' from the musical 'Oliver' and 'House Of The Rising Sun' by The Animals. Afterwards Oliver said 'the exam modules were extremely hard, as was the final exam, but playing live tonight was even more scary!! Well it was Halloween Oliver!!. Last but not least was Billy Davis. Billy is all the way from Pontesbury, Shrewsbury. He played a mixture of songs from The Shadows to The Arctic Monkeys and each one was note perfect, it was a pleasure to hear him and a lovely way to finish off the evening. 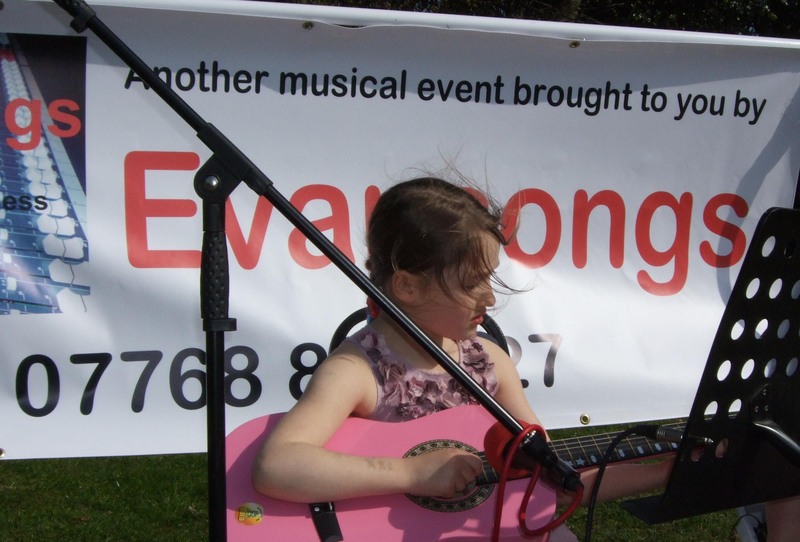 An 'eggstra' special and 'eggciting' event took place this week at Lilleshall Cricket Club as talented junior musicians turned up to perform at the Kids Open Mic Easter Special! First up on stage was Newport Junior Schools Macy Edwards and George Bate. They had written a special song for this Easter special and it went down a treat, with the audience clapping along. They finished with a song by The Killers with Macy jumping around the stage like a young Pete Townshend!! Local duo 'Latest Addition' were next consisting of Jay Harris and Liam Anslow. Both attend Moorfield School and last Thursday did a live performance in front of the whole school. With two guitars and harmonising vocals they are a pleasure to watch. Another Moorfield pupil next. Alfie Hampton had only had his new guitar for one day so it was near enough the first time he had had time to try it out but he made it sing with songs by The Kaiser Chiefs and Bon Jovi he really rocked the room. Always a pleasure to listen to is the delicate voice and gentle guitar work of Anika Srinivasan. By the time she had finished her set the whole room was in a chilled out mood! Not seen before at an open mic but I'm sure we will see much more of them in the future, brother and sister Adam and Layla Proffit. They had worked really hard to put on their performance today and they did not disappoint. With superb guitar work and harmonising vocals they played songs by Ed Sheeran and Passenger. Adam even played and sang happy birthday to a member of the audience - what talent. Afterwards mum Emma said 'all their hard work has paid off, the last two weeks in our house has been nothing but singing and guitar playing!' Open mic regulars next. Jack and Charlie Bate really know how the work the crowd and afterwards one member of the audience said 'I would have paid to see that', thanks for that but don't forget the kids open mic events are always free!! After seeing his brother jumping around the stage earlier Joe decided he would sit down to play. Joe Perrins who attends Burton Borough School had put together a varied set which included songs by Green Day and the Arctic Monkeys with some very delicate guitar work. Currently studying grade 3 guitar Quinn Cummings was next and he performed one of his grade pieces. He said afterwards 'this is the best place to practice!' Another youngster studying his guitar exams is Akos Daragos. He also decided to let the audience know what a grade piece sounds like and he played it so perfectly it's a shame it wasn't recorded so it could be sent off and marked! The next performer had taken his exam two weeks ago and got his results yesterday. Not only had he passed, not only did he get a distinction but he got 99%!! Yes, Billy Davies from Shrewsbury certainly set the standard and he showed his talent by playing songs by Black Sabbath, The Arctic Monkeys and The Shadows. Another debut next by a very talented Moorfield School pupil. Emily Davidson said she was very nervous but that didn't show at all as she cruised through some of her favourite artists including a fabulous version of Troublemaker by Olly Murs. The next performer has only been playing the guitar for a few weeks but what a performance from year 3 pupil Charlie Howard. He played the theme from 'Star Wars' and had even put on his Star Wars glasses to perform in, he certainly deserved his Easter egg! Last but not least sisters Megan and Leah Gillespie performed a selection of songs. Their vocals and guitars were in lovely harmony and it was a lovely act to send the audience away knowing that today's entertainment had been second to none. Ken then thanked Steve and Karen Bate for providing the venue, Ian Gillespie, Shelly Maddox, and Quinn Cummings for the quizzes, Sue Jenkins for the photos, The 'Cheeky Girls' (aka Jaquie Edwards and Mandy Bate) for organising the room and stage, Gerald Maddox for the sound engineering and most of all, all the parents who's talented kids are what makes these events so popular. 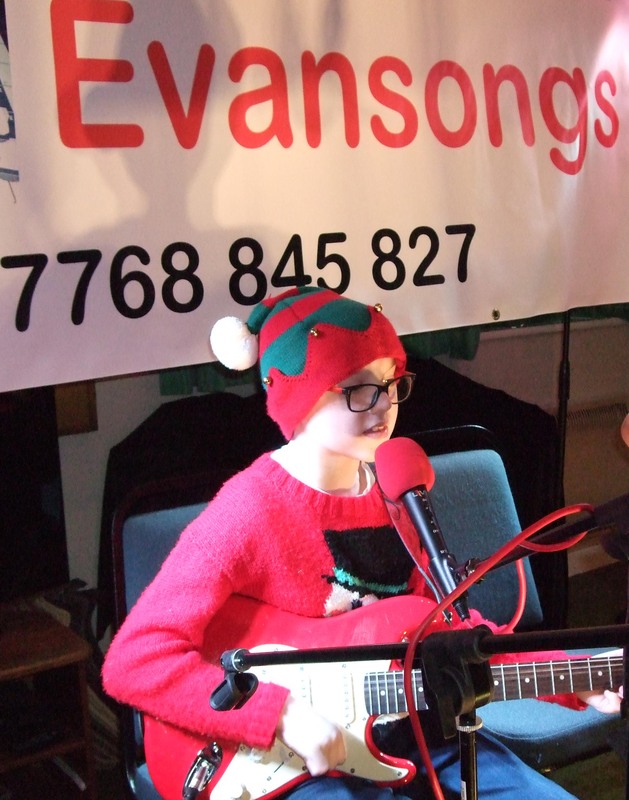 When Roy Wood sang 'I Wish It Could Be Christmas Every Day', it must have been after he had been to a kids Christmas open mic as last Sunday was an experience never to be forgotten!! For the first act over 20 junior guitarists were on stage singing and playing Slade's 'Merry Christmas Everyone' which got the packed room singing and clapping and well into the spirit of things. Steve 'Teddy Boy' Zodiac then said a few words and introduced the audience on the mayhem which was to follow. Then Newport Junior Schools Macy Edwards and George Bate graced the stage. They had brought their backing band with them 'The Cheeky Girls' (aka Jacqui Edwards and Mandy Bate - their respective mums!!). They played festive songs including Jingle Bells, Merry Christmas Everyone and a specially arranged (by themselves) song 'Little Donkey Rocks' before going off into the audience to sign autographs! What a hard act that was going to be to follow but there was one performer who could do just that, yes Alfie Hampton. Alfie recently passed his guitar exams so he was well polished and it showed by his fantastic version of 'Wombling Merry Christmas'. Jack Bate is a Kids Open Mic veteran so he just cruised through his set list of songs and the audience just loved it. Next it was time for the audience to take part and sing a carol. 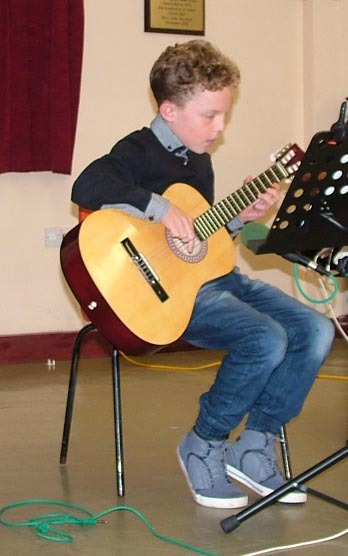 The backing music for the carol was provided on guitar by Moorfield Schools Akos Daragos. Akos then stayed on stage and played a variety of songs including a vey comic version of Rudolf The Red Nosed Reindeer! Next up was Quinn Cummings. Quinn and his family had sponsored tonight's event and we thank them very much for that. Quinn demonstrated his unique guitar and vocal skills with a song by one of his favourite bands 'Nickelback'. The next performer has not been playing guitar that long but what a performance from Moorfield Schools Megan Gillespie. She sang and played 'Somewhere Only We Know' and 'Sparkle And Shine' both of which she also sings in the Moorfield School Choir - what a beautiful voice and guitar accompaniment. Then the sound of reindeer bells filled the room and guess who had turned up - yes it was Father Christmas. The kids helped him to his seat where he spoke to them all and handed out presents before he took to his sleigh and flew off into the sky, whoa - we never expected that!!! Back to the music and Jess Clegg from Newport Junior School was next. 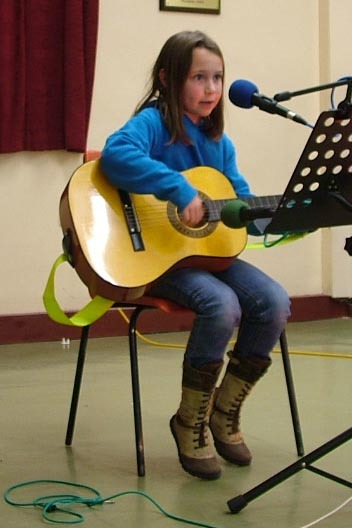 It is always a pleasure to listen to Jess play and sing and she makes it all look so easy, however we do know that she practices very hard and is soon taking her grade 1 exam for which we all wish her the very best. The Kids open mic has seen the next artist go from a very nervous young performer to a very confident and talented singer/guitarist. Yes, Moorfield Schools very own Liam Anslow gave a superb performance of songs by Status Quo and Eric Clapton and the audience could see and hear why he did so well in last week's Battle Of The Bands at Moorfield School. Only his second open mic but he is already making his mark, yes Joe Edwards gave a fine performance of classic songs including 'Fairytale Of New York'. It was time for the final performance of the afternoon and the slot was filled by Finlay Rogerson. 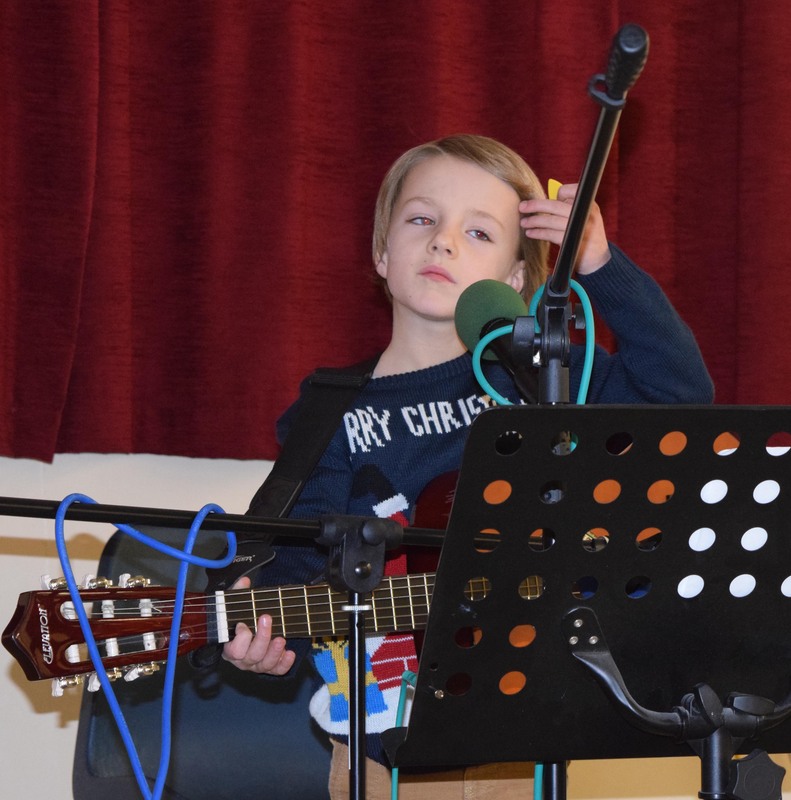 Finlay, who is a graded guitarist played some very technical guitar before singing and playing a note perfect 'Merry Xmas (The War Is Over)' by John Lennon. Finlay also plays guitar at his school, The Charlton in Wellington and I'm sure it won't be long before he is also giving guitar lessons there! After the raffle and answers to the quiz it was time for Ken Evans from organisers Evansongs to say a big thank you to Steve and Karen Bate for providing the venue and running the bar, Sarah and Mike Cummings for sponsoring this afternoons event, Quinn Cummings and Shelly Maddox for the quizzes, Gerald Maddox for engineering the sound, Sue Jenkins for admin and the raffle and to everyone else who helped out - you know who you are - we do!!! And finally a massive thank you to all the parents for having such talented youngsters without which we couldn't put on such a show! The moon was big and bright as you approached Lilleshall Cricket Club last Sunday and you could hear the dogs howling. In the car park you could see spooky shadows moving about. As you entered the club lounge you could hear spooky sounds. Yes - it was the long awaited Kids Open Mic Halloween special!! With the youngsters in fancy dress and the room full to bursting there was no time to lose in getting the budding rock stars on stage to play. Max Higginson was first up and he sang and played 'Living On A Prayer' by his favourite band Bon Jovi, and what an opening performance it was to what was to be a fantastic night of entertainment. Alfie Hampton was next on the list of players and he demonstrated his skills on the acoustic guitar and vocals with a superb rendition of Bobby 'Boris' Pickett's 'Monster Mash'! Another Moorfield School pupil up next and Anika, whilst playing only her second open mic, was just oozing with confidence. She performed 3 songs on her guitar before finishing with the Katy Perry song 'Roar'. The next performer is becoming an open mike veteran. 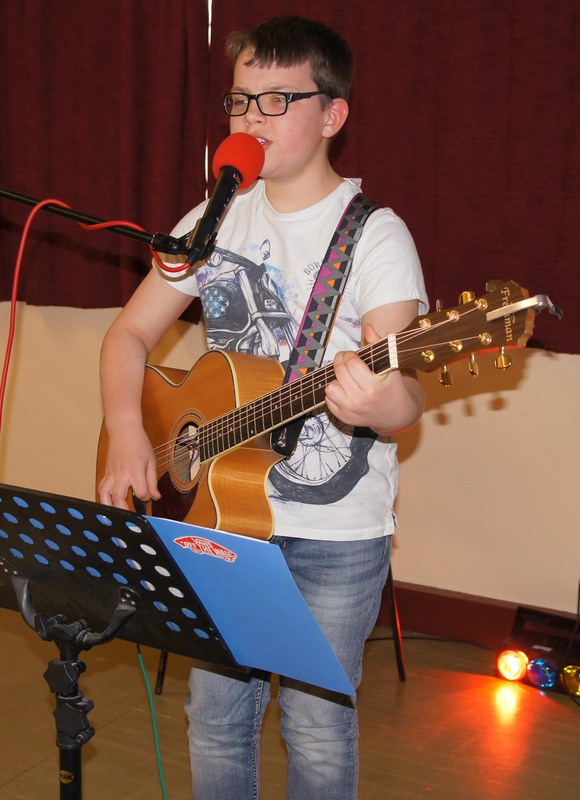 Year 6 Moorfield School pupil Liam Anslow has supported the kids open mic over the last 2 years and he goes from strength to strength. Tonight he delved back to the seventies to play 'Take It Easy' by The Eagles. Another open mic veteran next in the shape of Quinn Cummings. 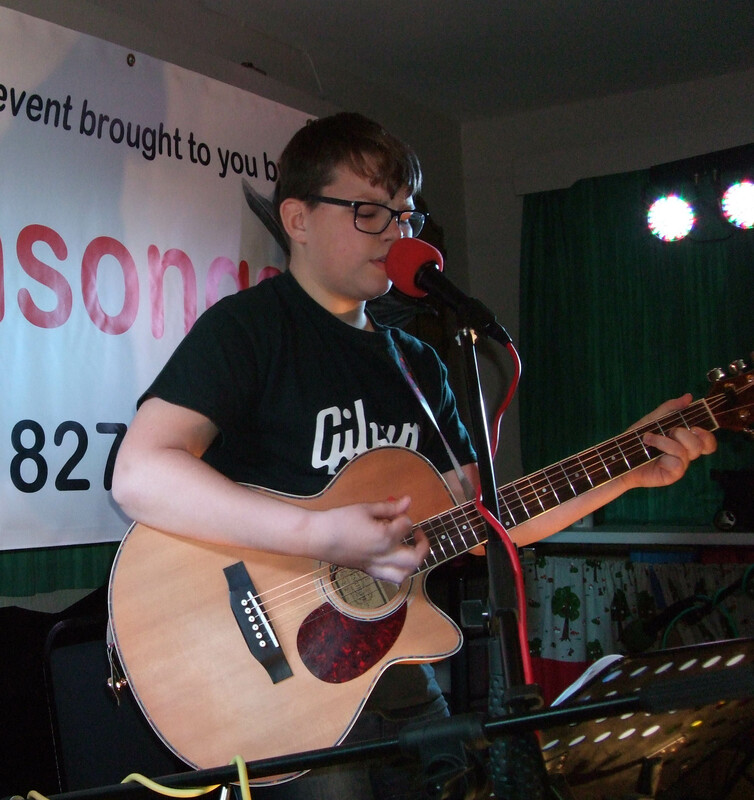 Quinn, a year 10 pupil at Burton Borough School, has been appearing at open mics for 4 years. He is currently taking his grade 2 guitar exam from which he played a piece from tonight. He also kept up the Halloween theme by playing and singing 'Werewolves Of London'! From veterans to performers making their debut and for Joe Perrins, who has only been playing the guitar for just over a month this was his debut. 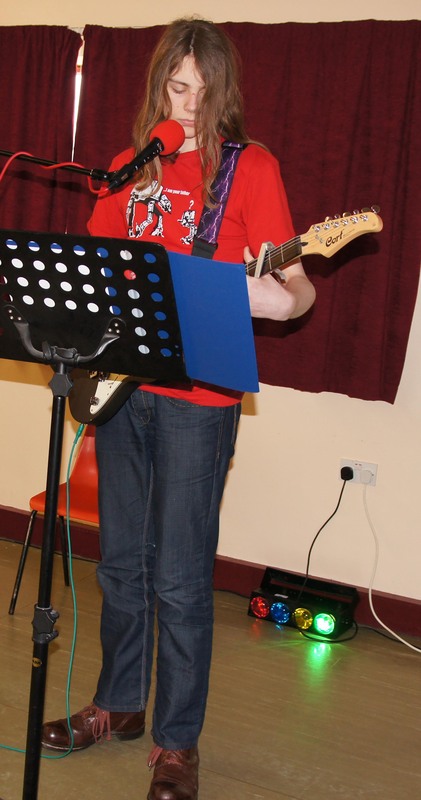 Joe, a year 10 pupil at Burton Borough School, certainly made his mark by playing and singing 'All Along The Watchtower', 'Wonderwall' and 'Teenage Dirtbag', all note perfect. Welcome to the world of Rock n Roll Joe!! Not to be outdone by his older brother, it was also time for Macy to make his debut. He had teamed up with his school friend George Bate to show the audience he could rock just as hard as his brother! Macy and George played songs by the Beatles and Oasis before finishing off with 'Monster' by Automatic. Another two very talented brothers entertained next. First Michael Rainbow who played 'Star Wars' before finishing with a superb rendition of 'The Simpsons' TV theme! Straight up then was brother Matt who tonight demonstrated his Bass Guitar skills with riffs from Fleetwood Mac, Black Sabbath and Survivor. Yet another Moorfield pupil! This time it was Akos Daragos. He played his way through his set of songs and had the audience clapping along and singing with him! His friend (another Moorfield pupil) Megan Gillespie followed and whilst having been only playing the guitar for a few weeks really performed well and she finished off with a song dedicated to her mum 'Happy Birthday'! An open mic debut next for Finlay Rogerson. Finlay is a year 7 pupil at Charlton School in Wellington. Last week he received his results for his guitar exam which he took through The University Of West London. He passed with a distinction! You could see why when he played songs tonight by Bastille and Deep Purple. Afterwards Finlay said 'the exam modules were extremely hard, as was the final exam, but playing live tonight was even more scary!! Well it was Halloween. Last but not least was Billy Davis. Billy is all the way from Pontesbury, Shrewsbury. He played a mixture of songs from The Shadows to Black Sabbath and each one was note perfect, it was a pleasure to hear him and a lovely way to finish off the evening. 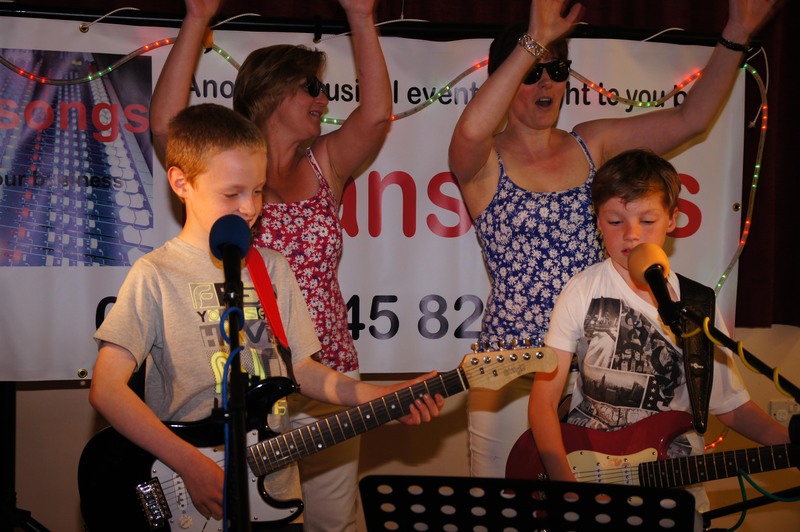 It was a packed house on Friday with standing room only as Lilleshall Cricket Club once again played host to the ever popular Kids Open Mic, where youngsters from 6 to 16 can get up on stage and show off their musical talents. Ken Evans from organisers and sponsors Evansongs opened the proceeding by telling the audience what they were about to experience and what an experience it turned out to be! Ken then introduced the first act, Isobel Mellings. 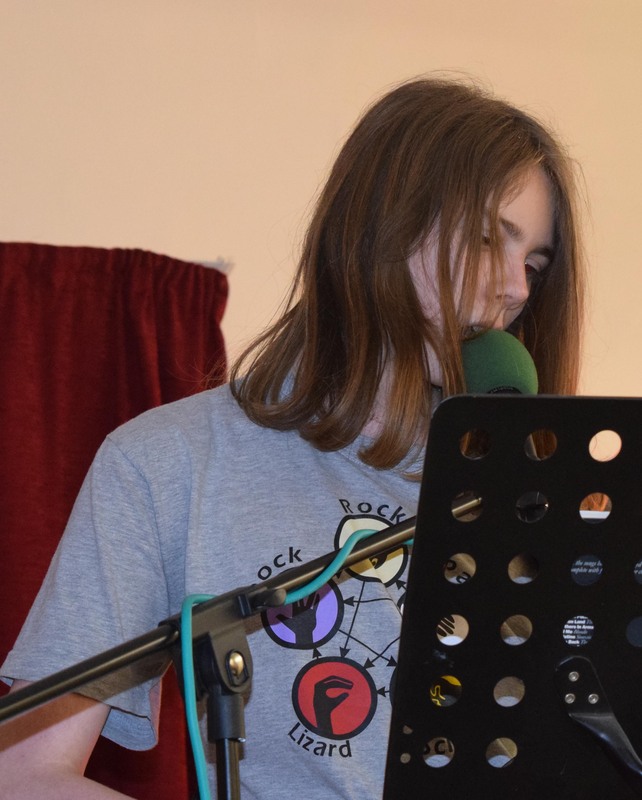 Isobel attends Newport Junior School, was making her open mic debut and she did herself and her school proud by singing 'Part Of Me' by Katy Perry note perfect. Next up were cousins Charlie and Jack Bate. No strangers to open mics they played their guitars in perfect harmony with Jack taking the lead vocals. Another debut next. Anika Srinivasan. 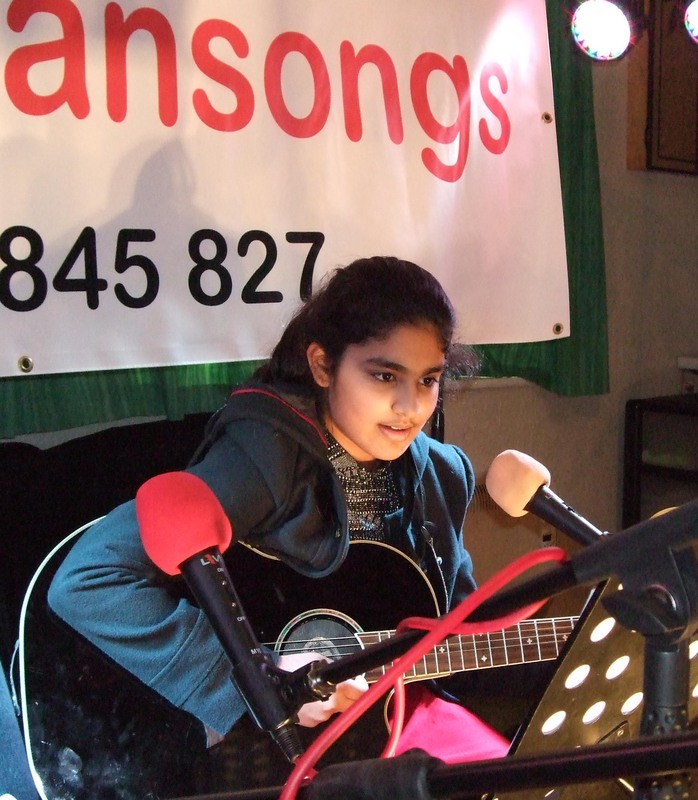 Anika attends Moorfield's School and is very keen on her music in school. 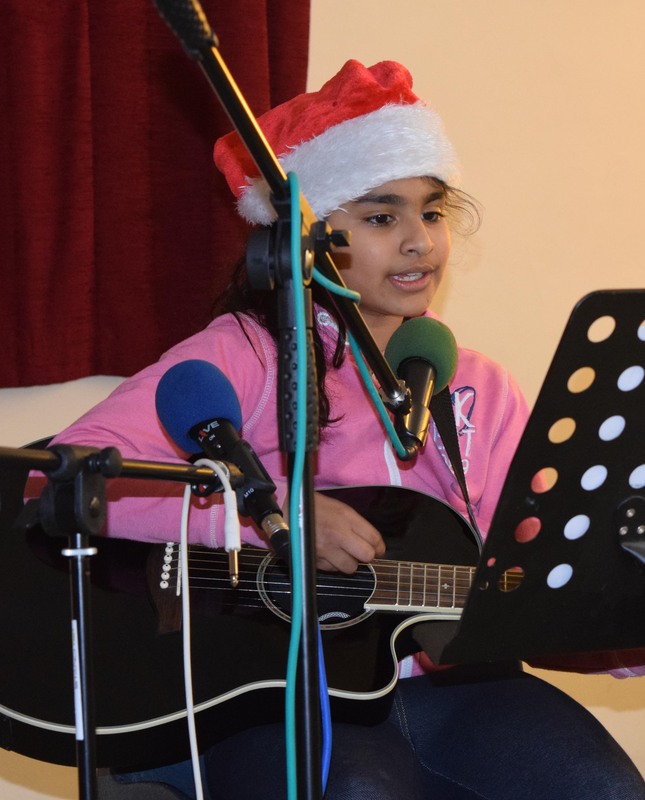 Usually when making an open mic debut musicians play just one song - not Anika, with confidence just oozing out she played and sang 5 songs ranging from 'Little Mix' to 'Bridget Mendler'. What an absolute stunning and perfect debut for Anika and I'm sure she'll be back for the next open mic. What a hard act that was to follow, but the next act is no stranger to open mic nights. With live performances at both The Lion and Navy Club open mics Jay Harris kept up the quality of tonight's music by not only playing his guitar but singing and playing his harmonica as well. I'm sure we'll see much more of Jay in the future. Using the open mic as platform to practice his songs for his forthcoming exams Alfie Hampton played 5 exam pieces and from what the audience heard there is no need for practice Alfie they were all note perfect! Building on his exam pass with distinction with The University Of West London, Burton Borough pupil Quinn Cummings played another grade piece and you could hear and tell that Quinn pushes himself to the limit to gain that perfect rendition of a song. Another Moorfield pupil next. Liam Anslow has been working on his own arrangements of popular songs so as to get away from sounding exactly like the original. He finished his set tonight with a version of Metallica's 'Nothing Else Matters' which included the melodic lead intro, the careful use of timing with chords and also harmonics. The audience were truly mesmerised. News travels far and the open mic tonight gave a very warm welcome to Billy Davies. Billy had travelled all the way from Pontesbury, the other side of Shrewsbury to play for us tonight. And what a performance he gave! Starting with a complete and note perfect 'Apache' by the shadows he followed on with instrumentals that would make Hank Marvin proud. Afterwards Billy said 'I was very nervous about playing in front of an audience I didn't know but they made me very welcome and I can't wait for the next one' - nor can we Billy!! Rocking the audience with his unique style next, was George Bate. George played 'Eye Of The Tiger' and 'Smoke On The Water' before singing and playing the beautiful Coldplay song 'Chocolate'. Another experienced open mic performer was up next. Dylan Webb who is just about to start at Adams Grammar School performed exam pieces which included a superb rendition of the Fleetwood Mac classic 'Albatross', close your eyes and you would have thought Peter Green was in the room! Last but not least tonight was Harry Roberts. Harry attends Moorfield school and is also in the choir there. You can tell why, for as soon as he started to play and sing his musical talent shone through. Harry also writes his own songs and has performed them in front of the whole school, he said he will play some self penned songs at the next open mic. There were shouts of 'OWZAT' at the kids open mic last Sunday, (2nd June)as the audience were bowled over at the events new venue of Lilleshall Cricket Club. Yes, a packed room saw plenty of young talent take to the stage to play and sing. Umpire for the evening was Ken Evans and he got things underway by introducing the first act, George Bate. 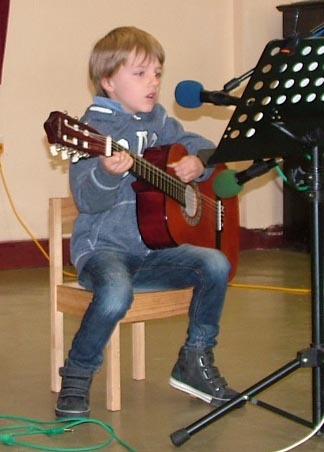 George, who attends Newport Junior School, has only been playing the guitar for 5 weeks but that didn't stop him belting out an Oasis number and then following up with his dad's favourite song 'Chasing Cars' by Snow Patrol, what a debut for George! Next up was an experience not to be missed. Seth Jurgens who attends Adams Grammar School, took his B C Rich guitar out of the specially made 'Coffin' case to entertain the audience with 'Leech' by Bullet For My Valentine', what a hard act that was to follow, but follow he did, yes, Moorfields Max Higginson took to the stage to demonstrate his guitar skills and finished off with a 'mystery tune' which the audience had to guess and it became one of the questions of the quiz (it was the Star Wars theme by the way!) he must have played it well as everybody got it right!! Quinn Cummings of Burton Borough School then demonstrated his intricate guitar work as he played some of his guitar exam pieces. Quinn recently passed his Grade 1 guitar exam with distinction through the University Of West London. The next artist is becoming quite an open mic regular. If you are a reader of The Newport Advertiser you will have seen his photograph in it over the last couple of weeks performing at The Navy Club. At only 10 years old Moorfields School pupil Jay Harris is making quite a name for himself as a solo performer and he showed the audience tonight why. Next it was time for two cousins to keep up the quality of this evenings performances. Jack and Charlie Bate, (Moorfields and Priorslee Schools respectively) took to the stage and had the audience clapping along with some fine guitar work and vocals. Another relatively newcomer to the guitar but making his second appearance at an open mic was Moorfields Akos Daragos. Showing his skills on both the electric guitar and bass guitar Akos will never be short of work on the music scene! Newport Junior Schools Jessamy Clegg was next and the only girl in this evenings schedule! 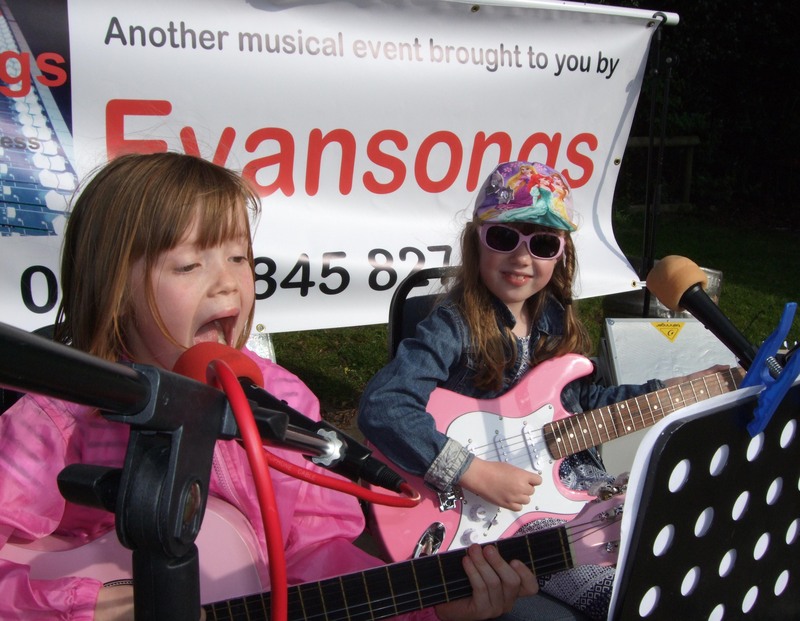 She had invited her guitar teacher to accompany her on the bass guitar and they together played songs by The Monkees and Johnny Nash, her teacher said afterwards 'Jess is a really good performer and it was an honour to be asked to accompany her'. Time for the last act and what a finale by Moorfields Liam Anslow. Liam had decided to play acoustic this evening and what a treat with songs by Eric Clapton and Jason Donavan he had the audience in his hands. And so another very successful evening had come to an end with just the prize giving for all the quiz's etc that had taken place over the proceedings, and talking of prize giving, if any teachers at any of the schools mentioned above are reading this, come on, give your pupils some extra house points! Organiser Ken Evans then thanked Steve and Karen Bate for organising the use of the cricket club and bar, Russ Harris for the sound, Sue Jenkins for the admin, Quinn for his quiz but most of all to the parents and performers who made this event the best so far in our 10 year history of Kids open mics in Newport. See you soon. 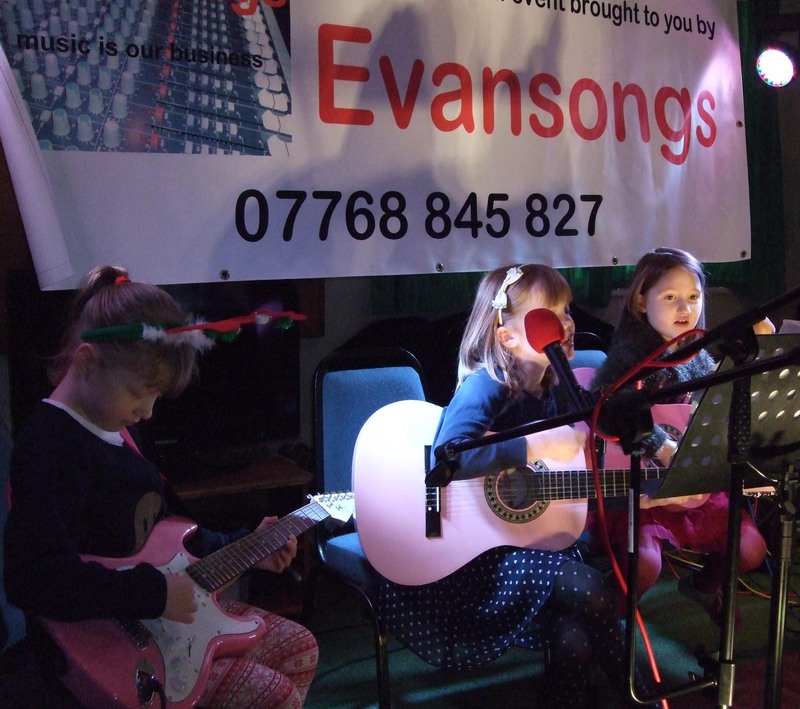 Newport's finest young musicians were out in force last Thursday at The Lion Junior Open Mic Christmas Special. With the room full to bursting organiser Ken Evans introduced the audience to the 10th year of junior open mics which have given many young musicians their first taste of playing live. First up on stage was Jay Harris. 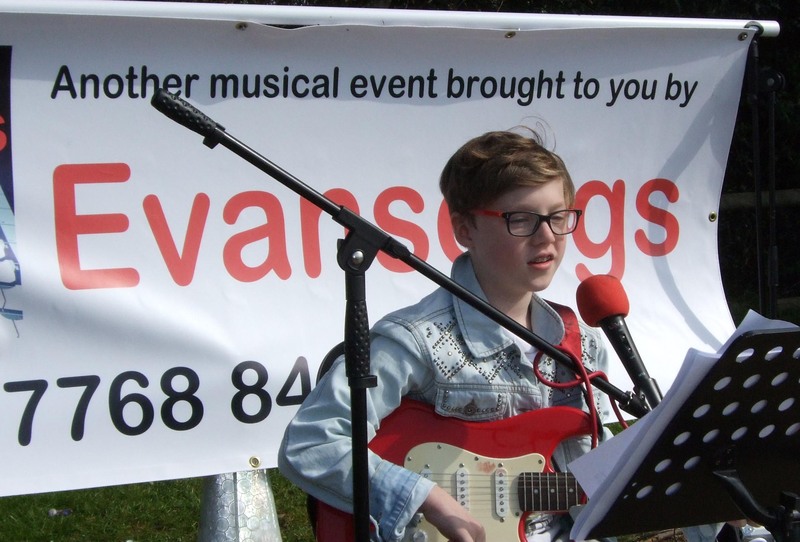 Jay is a year 5 pupil at Moorfield School and regularly plays his guitar at school, in fact that very afternoon he came second in the battle of the bands competition, and the audience could see why as he sang and played songs by Oasis note perfect. Max Higginson was up next. 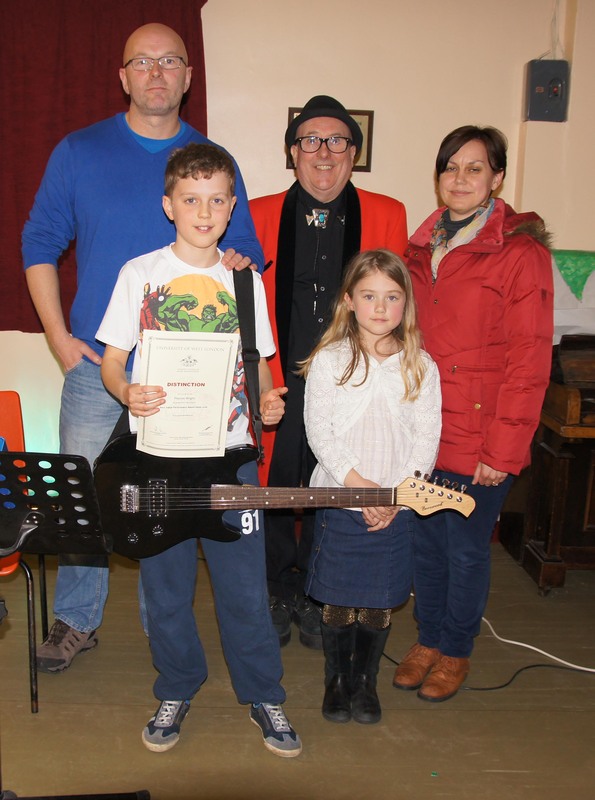 Before he started organiser Ken informed the audience that last week Max had passed his guitar exams with distinction it was obvious why he got a distinction when he belted out some tunes and had the whole audience rocking! Two cousins were next. Jack and Charlie Bate. they took to the stage and played as a duo and also did some solo stuff. Music sure does run through the Bate veins!! The next performer has only been playing the guitar for 4 weeks but you would thought it was 4 years as Akos played two songs note perfect. Jay Harris then came back on stage and played some famous riffs but this time on his bass guitar. What a talent Jay has. Up to now it had been very male dominated but that soon came to a halt as Jess Clegg graced the stage. Jess has already passed her debut guitar exams. She started off with the title song from the film Nazareth before getting the packed room to sing Yellow Submarine along with her! Jess then sang her own composition 'What Pirates Do On Holiday' which she has recorded onto CD. Next up was Quinn Cummings. Quinn has been coming along and playing at the junior open mic nights for 4 years. He informed the audience that he had recently taken his Grade 1 guitar exam with the University Of West London and he wasn't sure which was more stressful, playing live here tonight or waiting for his results!! Quinn returned home to find the postman had been and had delivered his results - a pass with distinction!!! All the guitarists then assembled at the front of the room and played 'Silent Night' whilst the audience provided the singing. Then, just before the final verse the sound of sleigh bells could be heard. The room fell silent but not for long as in came FATHER CHRISTMAS!!! 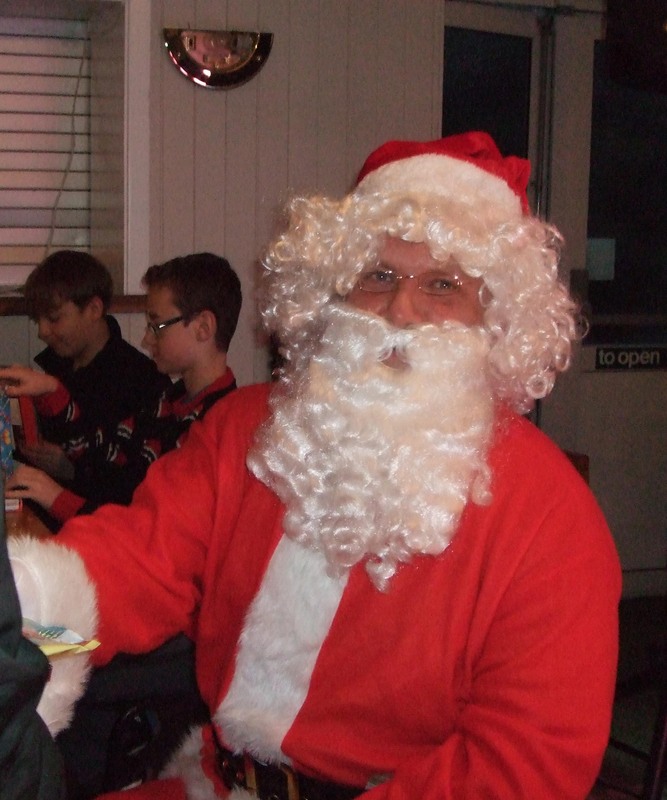 He couldn't stop long as he was very, very busy but he did manage to give the youngsters a present and make a list of who wanted what for Christmas. Another examination success was next in the form of Dylan Webb. Dylan is a very talented musician and showed off his skills to the audience by playing graded exam pieces for which he didn't miss a single note - well done Dylan you certainly set the standard to maximum! Another newcomer to the guitar was next. 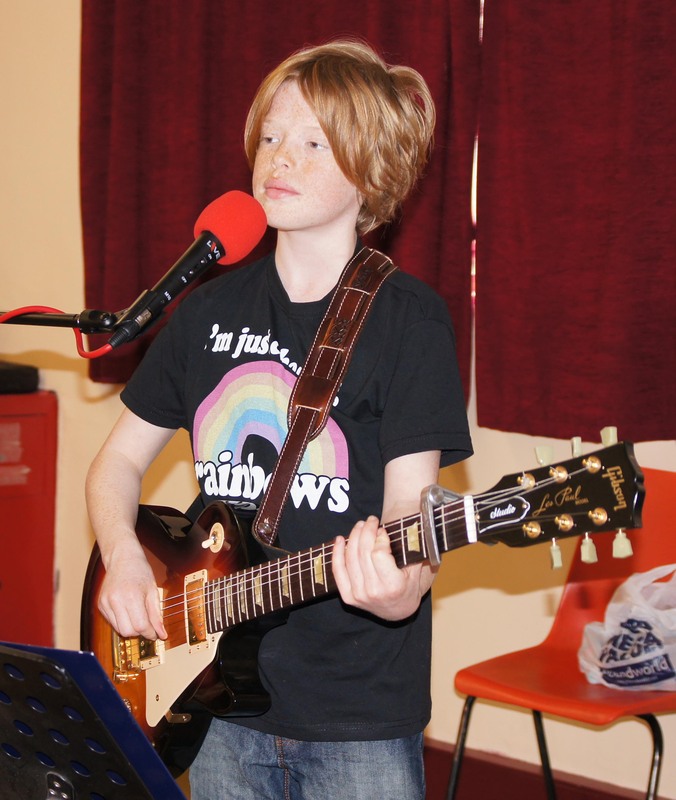 Michael Rainbow is a pupil at Moorfield School and is keen to play his guitar there and by what we heard I am sure he will be asked to play at other venues as well. Dayna Browning is a credit to her mum Luna who has done so much for her in her music and musical theatre. She has appeared on Britain's Got Talent and has performed in shows in the West Midlands and at her school, Burton Borough. She demonstrated tonight her skill at playing the guitar as well as her singing. 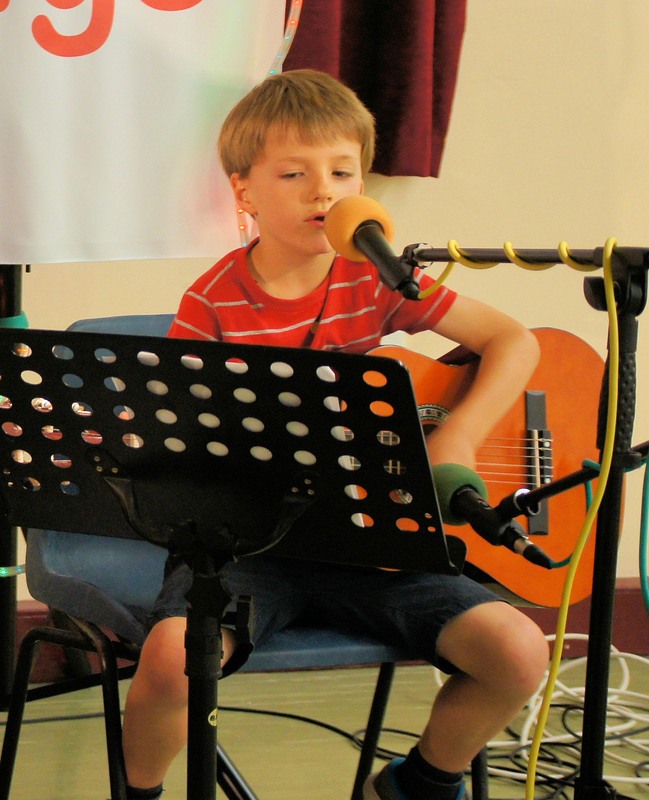 Mathew Rainbow was not to be outdone by his younger brother Michael so he graced the stage and had the audience mesmerised by his guitar playing skills. Another regular at the open mic nights who is always a pleasure to listen to is Frankie Jones and again she demonstrated what a talented performer she is. Phoebe Blythin rounded off the evening with some superb vocals that had the audience in tears. And so with a few games of Kens Krazy Bingo, Quinn's Quick Quiz, Kens Kolouring Kompetittion, Shelly's Quiz and the raffle all done it was time for organiser Ken to thank John Hill for sponsoring tonight's event, Jon Lloyd for doing the sound, Sue Jenkins for the admin and prize giving, Shelly Maddox and Quinn Comings for the quiz's and most importantly all the youngsters for providing the entertainment. There was something Eggstraordinary but very Eggciting happening in Eggmond this week as the junior open mic night staged it's Easter special. Youngsters aged 6 - 16 descended on The Lion to show off their talent and what a night of talent it was! The room was absolutely heaving but that didn't worry the first act which was local band JJL. The audience were so excited they kept chanting 'we want JJL'. The band had trouble getting to the stage because of their fans but they eventually made it. JJL who consist of Jay Harris, Jack Bate and Liam Anslow who all attend Moorfield School, played songs by Status Quo and Oasis and also did some solo spots. Spokesman for the band Jay said afterwards 'I have never seen anything like it, the crowd went mad, even my Grandad asked for my autograph afterwards'. A hard act to follow but Alfie Hampton did just that. He played happy birthday for his mum (who wished not to disclose her age!!) and then followed that up with Congratulations by Cliff Richard. The next act was a real treat. Lisa-Jayne Frawley is a year 11 pupil at Burton Borough School and is about to take her GCSE's. She said 'playing tonight is giving me a bit of chill out time from all the revision I have got to do'. If she does her exams as well as she did her songs it's A+ for the lot!! From the eldest performer to the youngest. Castle House Year 1 pupil Megan Hardy graced the stage and played a song from her book that she uses for her music studies at school. Afterwards she said 'I love music and Castle House school is the best'. Quinn Cummings was next up. 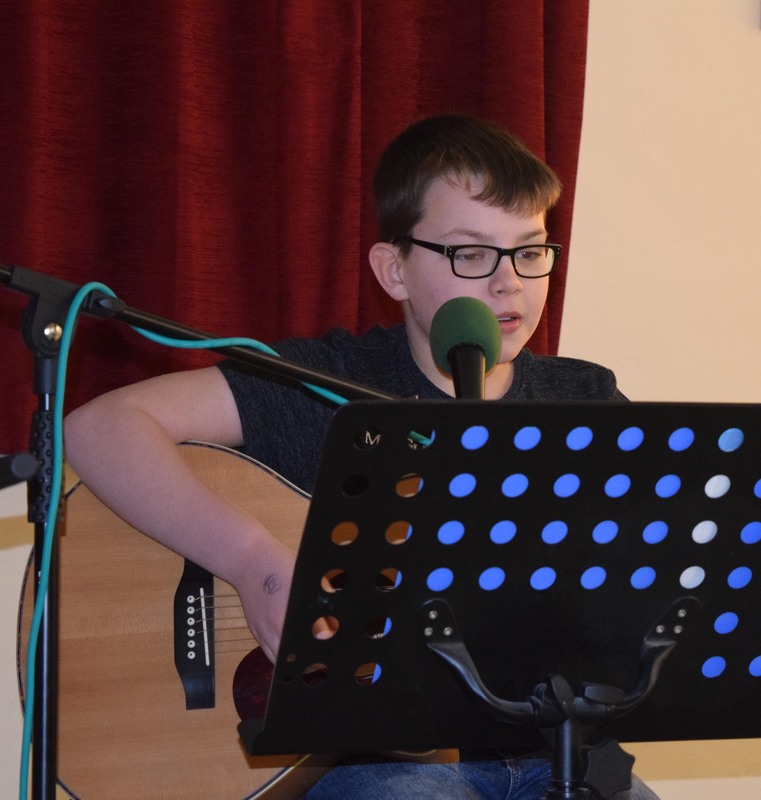 Quinn has been coming to the junior open mic nights for a number of years and has established himself as having played more times than any other past performers, well done Quinn. A touch of the Gothic next as Seth Jurgens took out his 'Draco' guitar from its coffin case. Seth, who attends Adams Grammar School, composes music for horror films and demonstrated his talent for that tonight. The very musically talented Frankie Jones was up next and she had put together and written the score of a medley of songs including the theme tune from the TV programme 'Friends'. Another regular contributor to the open mic nights, Josie Miller, demonstrated her unique talent as a singer and instrumentalist. It was debut time next for Dylan Webb. Dylan is studying for his guitar exams so he thought what better way to entertain than to play a couple of grade pieces, which he did - note perfect. Alana Whittington is no stranger to the stage with many performances behind her in various musicals. Tonight she sang three songs including White Flag by Dido. The audience was mesmerised as she sang every note perfectly. A newcomer not only to the open mic nights but also to the guitar was on next. Ethan Kelly has only been playing for a few weeks but his performance tonight of The KIngs Of Leons 'Use Somebody' would have you believe he was born with a guitar in his hand! Next up was Dayna Browning. Dayna is such a talented young lady. She plays guitar, sings, acts and is always on top form. I am sure she will make a very successful career out of the entertainment business as will her also very talented sister Louise who sang A cappella and just had everyone in the room stunned at her powerful voice. Phoebe Blythin was next and was well worth the wait as she played songs by her favourite band Florence And The Machine. Her use of the acoustic guitar is superb and she is always a pleasure to listen to. Last but not least was Zac Hayes. Zac demonstrated his talent by playing exam pieces which he certainly handled well. With a couple of games of Ken's Krazy Bingo, and Shellys quiz out of the way it was sadly time to end the evening. Organiser Ken Evans of tonight's sponsors Evansongs thanked everyone for coming along and especially those who played. He also thanked Sue Jenkins for the prizes, Jon Lloyd and Grahame Weir for the sound and Shelly Maddox for the quiz.